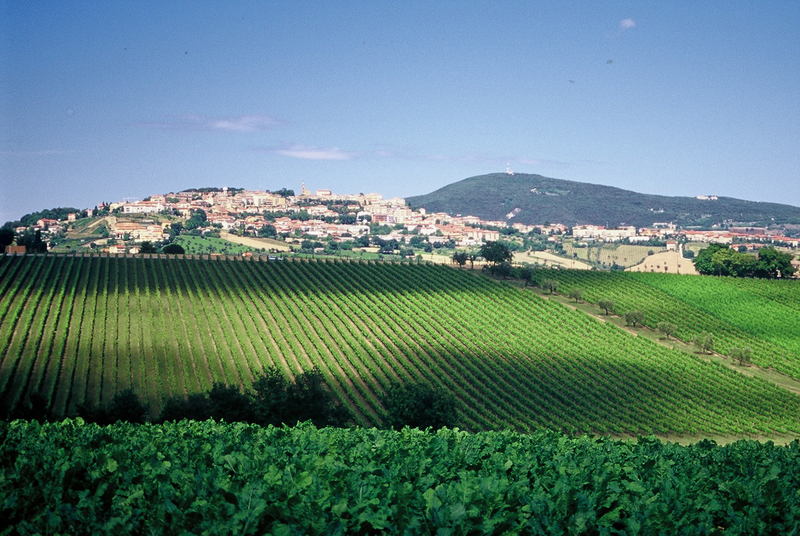 The Bocale winery and vineyards, showing the landscape of Montefalco – photo courtesy of Montefalco wine. I love Italian wine and am fascinated by the enormous potential there is in every corner of that amazing wine producing country. 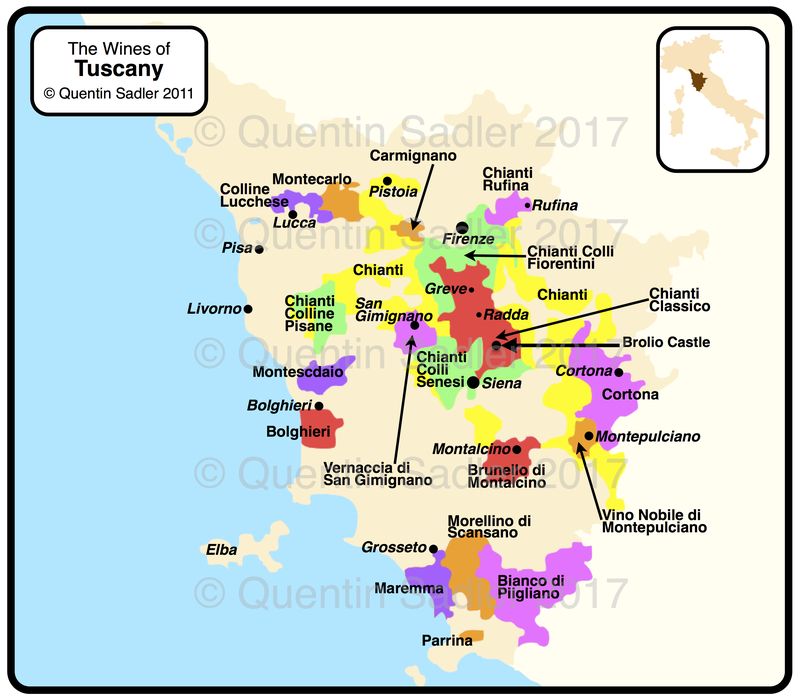 Excitingly every now and again a region emerges from relative obscurity to sit alongside the famous classic wine regions such as Barolo and Chianti. We might well be experiencing such a moment right now. 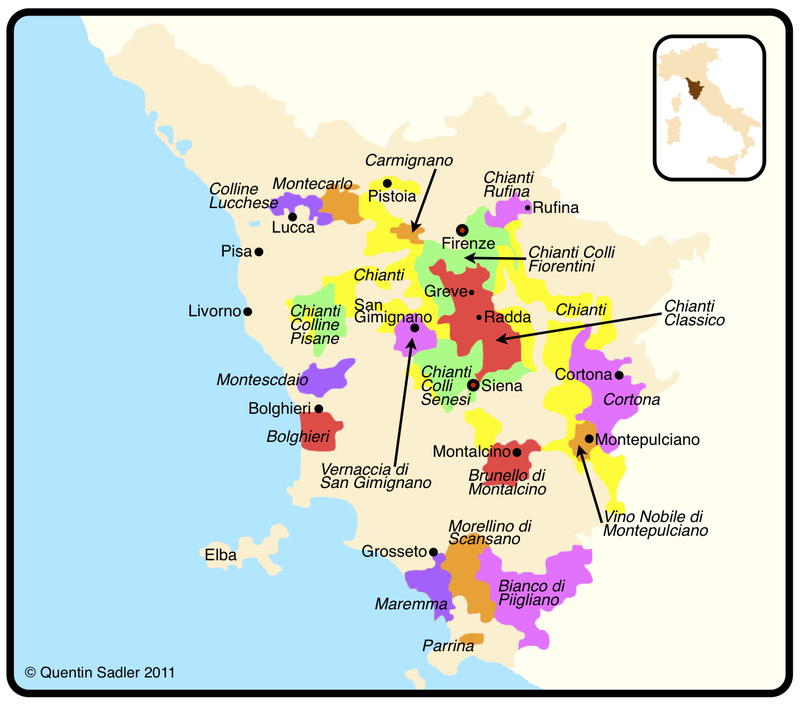 Map of Umbria’s wine areas – click for a larger view. The landlocked province of Umbria neighbours Tuscany but feels more rural and quiet. 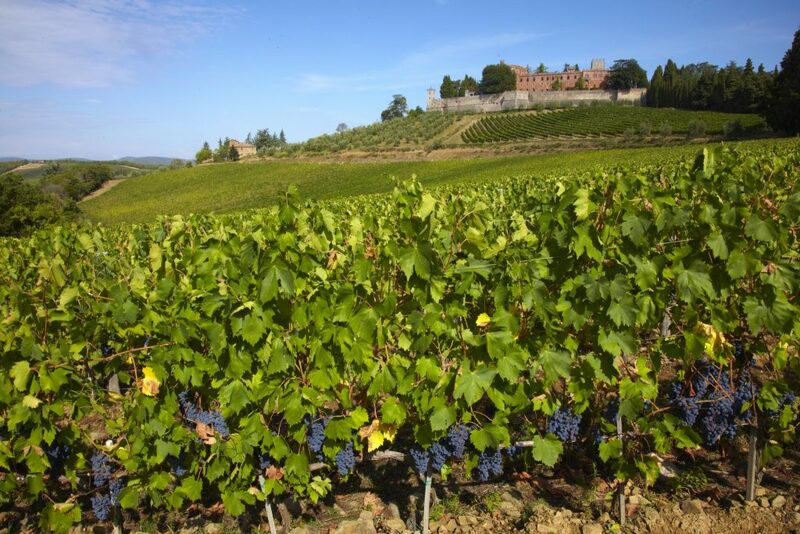 Wine has been produced here for centuries with the whites of Orvieto and reds of Torgiano enjoying some success. Neither though have managed to break through into the ranks of the great regions. 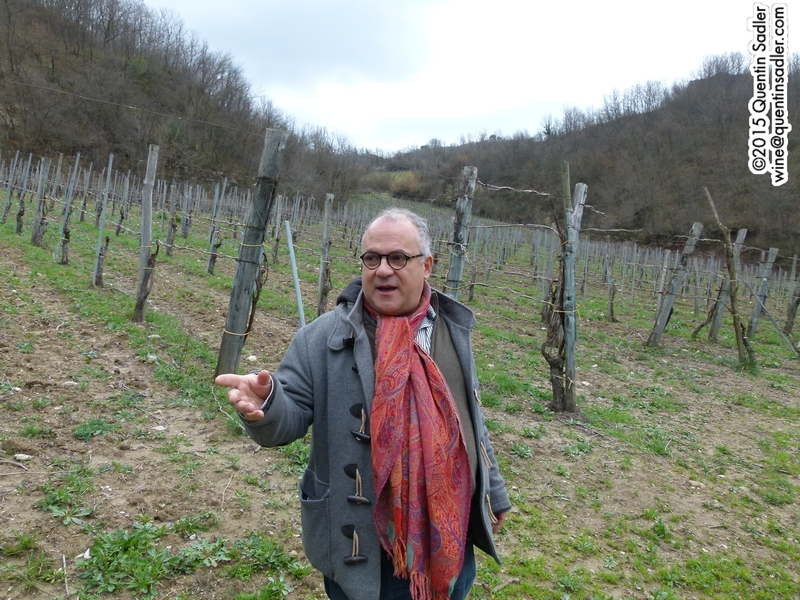 Umbria might now have found its true champion though in the tiny wine region of Montefalco. I visited recently and loved what I found. This delightful place is well off the beaten track – my taxi to Montefalco from Rome Airport covered nearly half the distance on unmade roads – and is centred on the pretty hilltop medieval town of Montefalco. 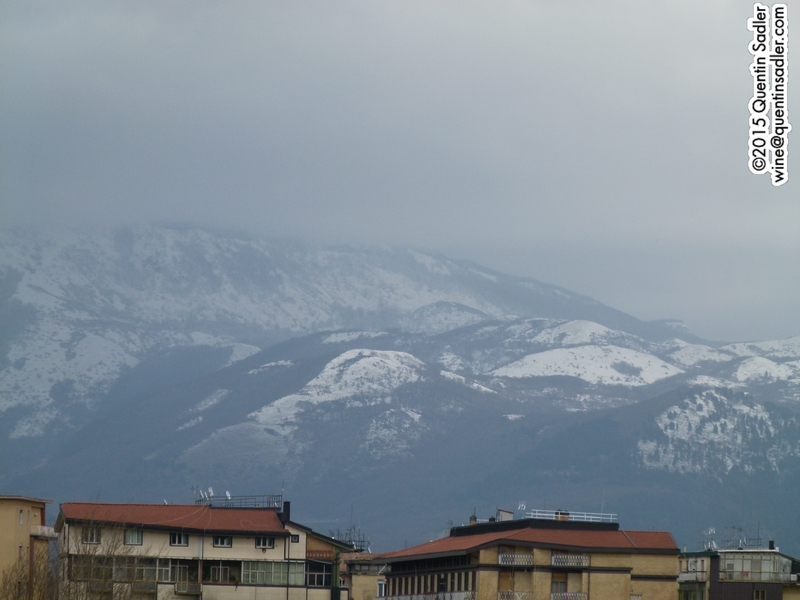 The hilltop town of Montefalco – photo courtesy of Tabarrini. It’s small, but utterly charming with beautiful narrow streets, fortified town walls and a scattering of wine shops as well as some excellent restaurants. It’s a delightful place to wander around but at its heart is the wine produced in the surrounding countryside. 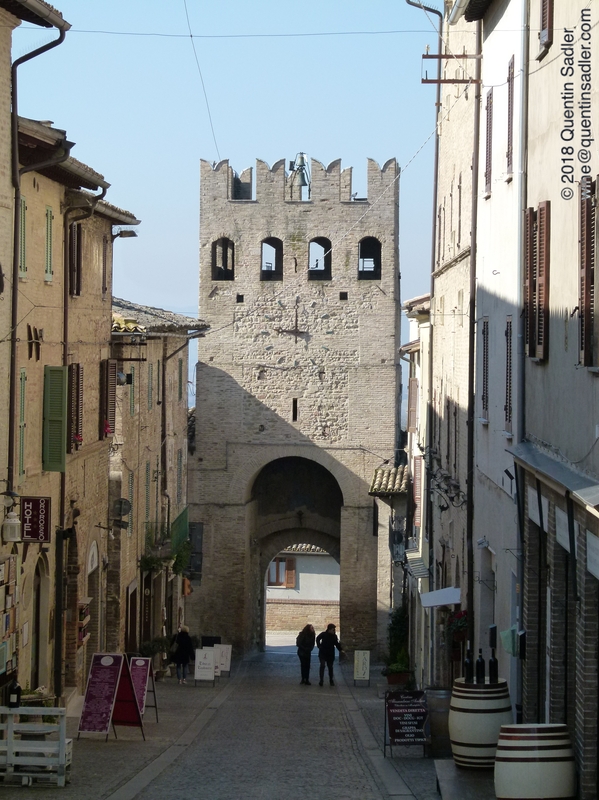 The delightful main street and gate of Montefalco – photo by Quentin Sadler. The place enjoys a Mediterranean climate – they grow olives here in abundance – with some aspects of a continental climate, including very cold winters. Two distinct styles dominate local red wine production, Montefalco Rosso DOC and Montefalco Sangrantino DOCG. DOC / Denominazione di origine controllata wines come from recognised traditional regions and are made from grape varieties traditional to that place. Much like the French Appellation d’origine contrôlée regulations these are a guarantee of quality and provenance. DOCG / Denominazione di Origine Controllata e Garantita is a step above and the rules are more stringent, with longer ageing and lower yields. The Montefalco Rosso wines are blends based on 60-80% Sangiovese, the famous grape of Chianti in Tusacny, together with 10-25% of the local Sangrantino grape and often some Barbera and Merlot. One of the oldest estates in Montefalco is the wonderfully named Scacciadiavoli – it means to banish devils and celebrates an exorcist who lived nearby. It was founded in 1884 and this is where they created the local Rosso blend of Sangiovese and Sangrantino as an alternative to Chianti. Montefalco DOC was created in 1979 as a recognition for the improvement in the local wines. 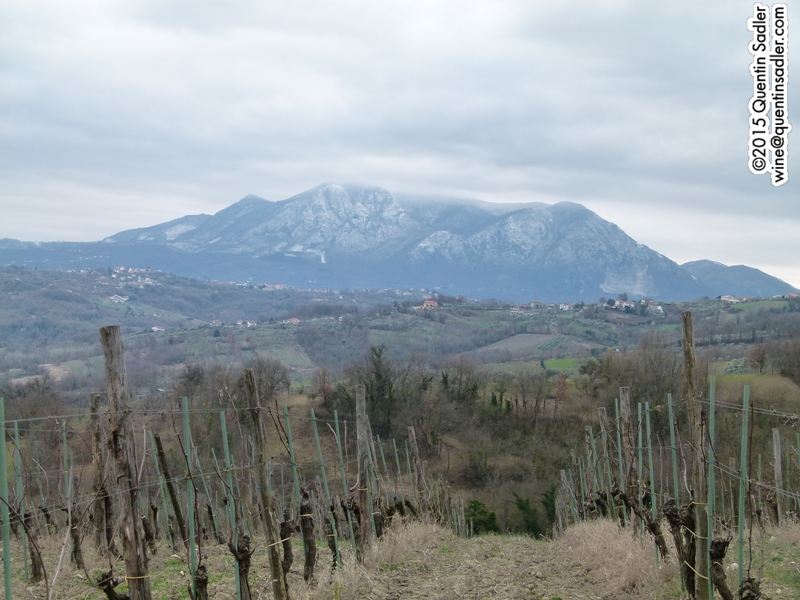 Some fine dry whites are made here as well as reds, from blends based on the excellent Trebbiano Spoletino grape – which is a variety on its own and not Trebbiano. 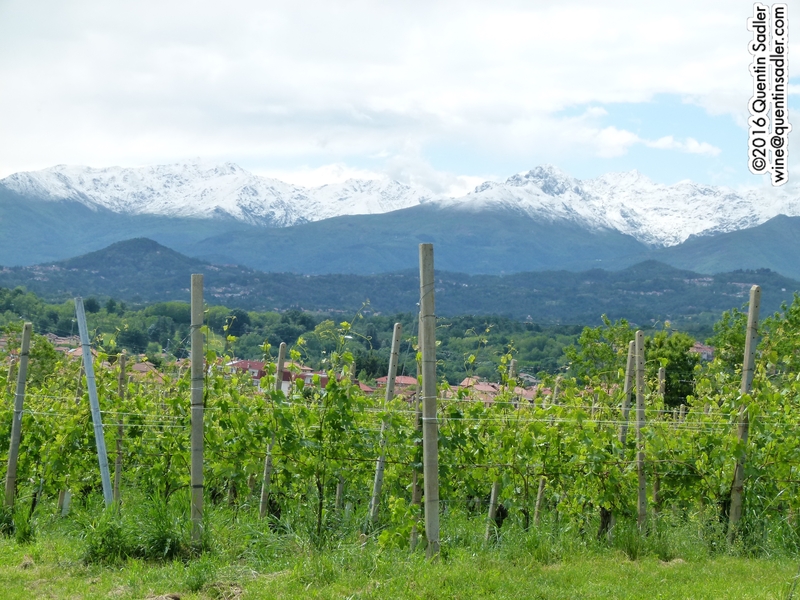 There are also some lovely crisp whites made from Grechetto (grek-ketto). 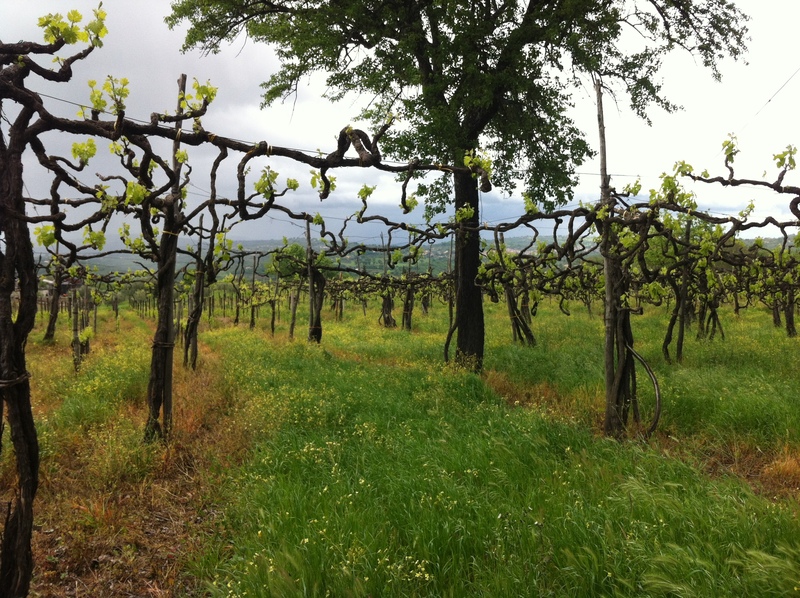 Trebbiano Spoletana vines growing the trees at Tabarrini – photo courtesy of Tabarrini. 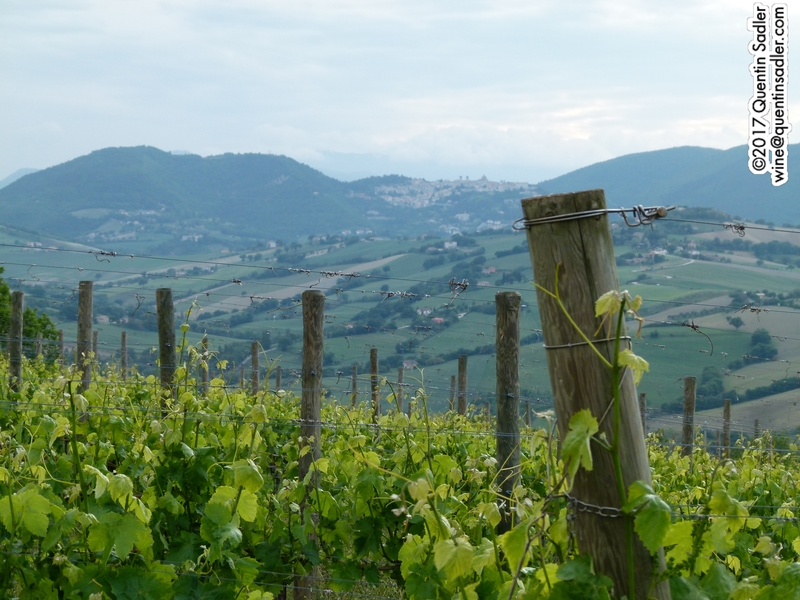 I would also add that the nearby Spoleto DOC, which overlaps with Montefalco, produces some truly great white wines made from Trebbiano Spoletino. Without a shadow of a doubt though the premier wine from this region is the Montefalco Sangrantino DOCG and it is this which is fast becoming one of Italy’s star red wines. Originally it was simply a part of the Montefalco DOC, but was separated out and promoted to DOCG status in 1992. The rules specify that the wine must be aged for a minimum of 37 months, including at least 12 months in barrel and 4 months in bottle. Historically Sagrantino was considered so harsh and tannic that they either made sweet wines from it or blended it with softer, less tannic varieties. Scacciadiavoli made the first dry red wine made from the Sagrantino grape, that we know about anyway. It was in 1924 for a local festival and was only made once, before they reverted to the more normal sweet wines. The move to dry reds happened slowly from the 1960s onwards. 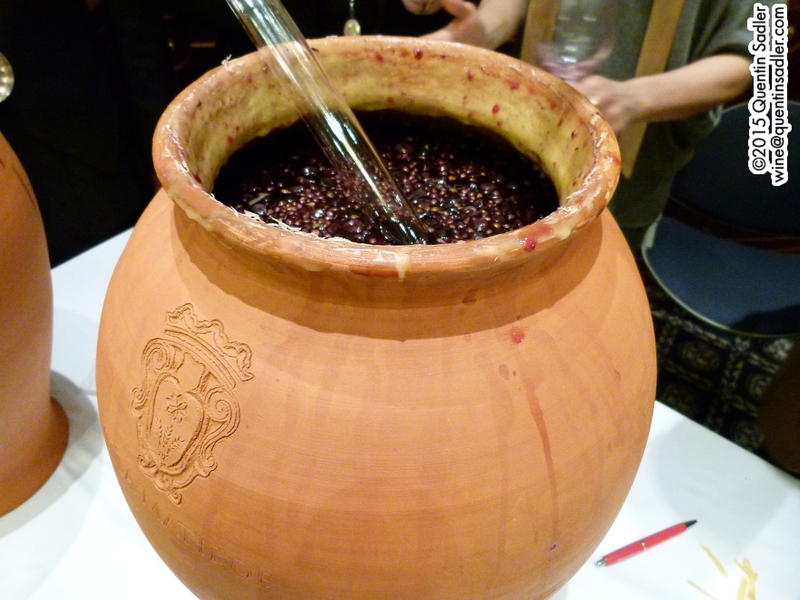 The sweet wines still exist though with many producers making a Passito Sagrantino from grapes that have been dried to concentrate the sugars. The approach to Arnaldo Caprai – photo by Quentin Sadler. 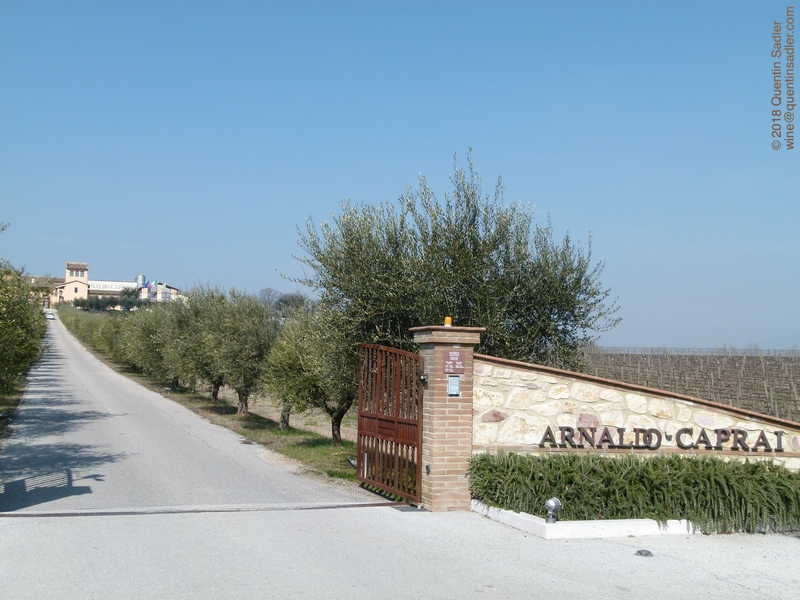 One of the most famous estates here is Arnaldo Caprai which was a pioneer in adopting modern techniques that lifted the quality of the dry wines. This foresight made the wines more exciting for foreign markets and helped others to see the potential. As a result the few old established estates here seem to have raised their game and to have produced more ambitious and finer wines, while newcomers have flocked to the region to create new vineyards. Today there are over 50 producers of Montefalco Sagrantino. In some ways the wines appear similar in flavour to Sangiovese, with red berry fruit characters, an earthy quality and plenty of food friendly acidity to give balance. The bigger wines, from riper vintages and the more internationally focussed producers, combine these with deeper black fruit flavours too, while a little bit of age brings out the complexity of dried fruit and leather. The wines always have that tannic structure that is more reminiscent of Barolo than Chianti though. It seems to me that although it has been a very long time coming, Sagrantino has found its moment. Greater understanding and modern knowhow, including gentle handling, cold fermentation and less new oak seems to have tamed Sagrantino’s tannins, delivering ripe fruit and seductive charms that give the wines much wider appeal than ever before. Yes indeed there are tannins, but they are approachable and enjoyable, giving the wine structure rather than bite. I have tasted some older vintages that I enjoy, but for me the quality of the wines really took off from the excellent 2011 harvest onwards. Time and again it was the, cool, 2014 vintage and the ripe, generous 2015 and 2016 wines that impressed me the most. Yes these are bold wines with big flavours, but there is real elegance and finesse here too so they should appeal to lovers of Bordeaux, California and Rioja, as well as Barolo, Brunello and Chianti. The opulence, generous fruit and elegance makes these excellent restaurant wines that partner so much more than just Italian food. 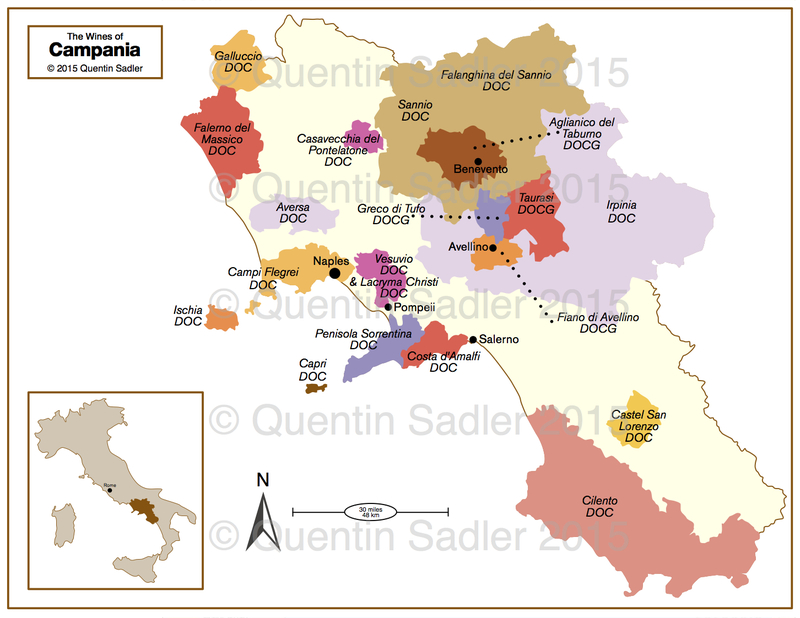 Montefalco Sagrantino truly has become one of Italy’s new star regions. 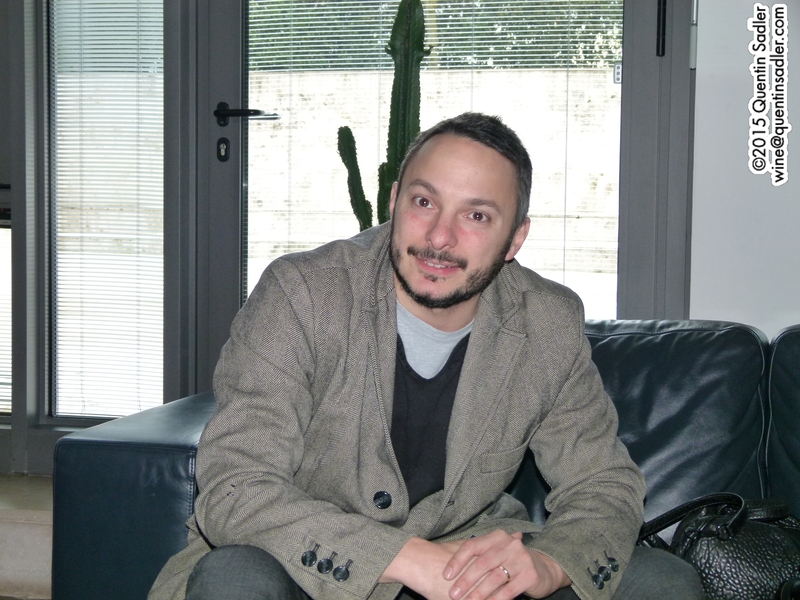 Marco Caprai, whose vision and drive helped to inspire the region – photo by Quentin Sadler. 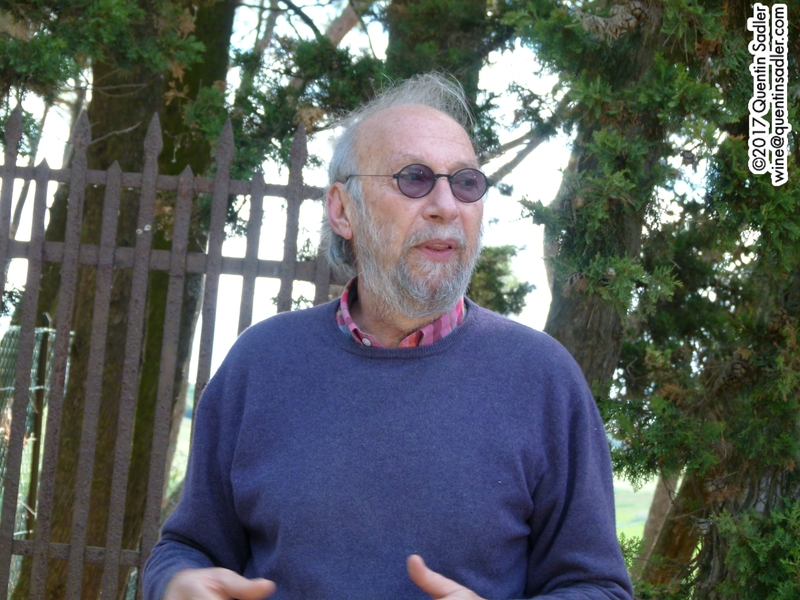 Arnaldo Caprai – In many ways the estate that set Montefalco Sagrantino on the path to its current glory. Founded in 1971, Marco Caprai took over the reins from his father Arnaldo in 1988 and immediately started an in-depth analysis of the Sagrantino grape, the clones on the estate and how to grow this tricky variety. The results speak for themselves with the wines achieving a global following and wide acclaim. In many ways these are amongst the most international and opulent – indeed there is a touch of Napa Valley to the winery and tasting room – but the range is impressive and the quality is very high across the board. Try: Valdimaggio single vineyard Montefalco Sangrantino with its rich, but balanced fruit, spice notes and silky texture. Arnaldo Caprai wines are distributed and retailed in the UK by Mondial Wine. 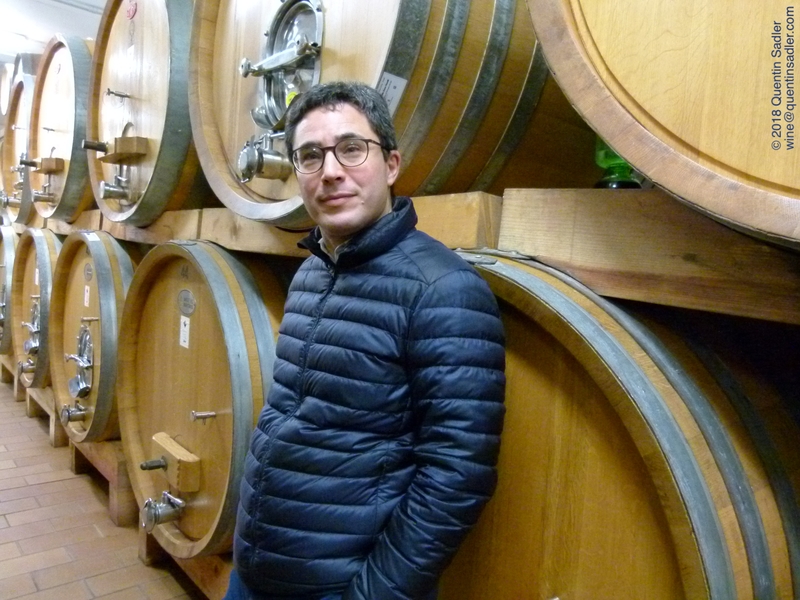 Matteo Basili, the winemaker at Beneditti & Grigi – photo by Quentin Sadler. 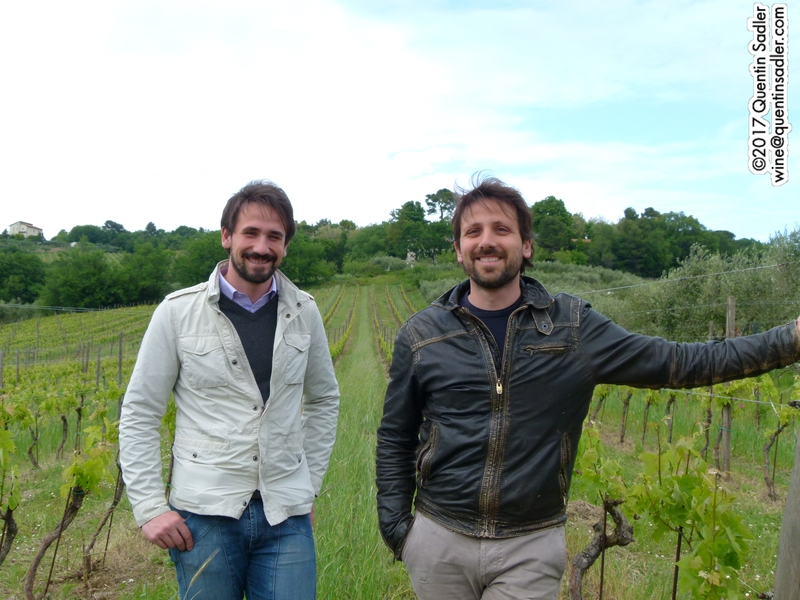 Beneditti & Grigi – Founded as recently as 2014, this newcomer makes very high quality wines under the guidance of Matteo Basili who is a passionate, honest, openminded and engaging winemaker. 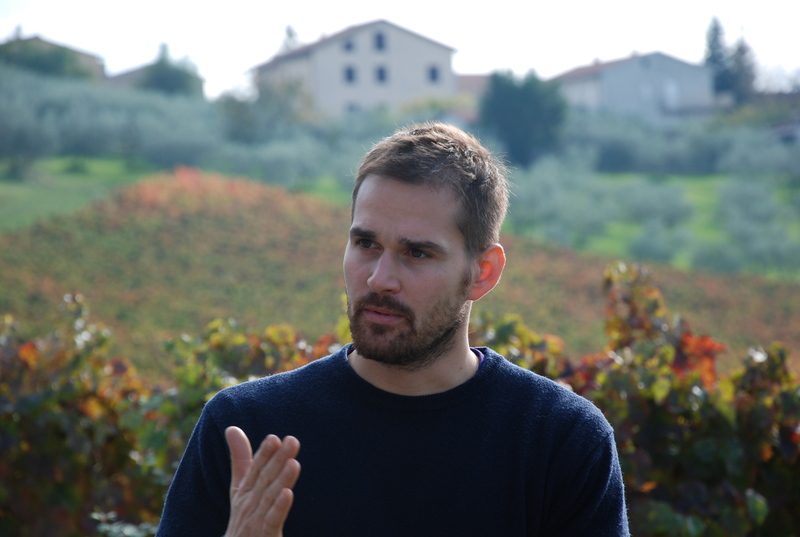 He creates two ranges; the easier drinking La Gaita del Falco and the more complex Beneditti & Grigi line. Try: Adone DOC Montefalco Grechetto white is a stunning take on the Grechetto grape. It is partially barrel fermented and is both delicate and rich with lovely refreshing acidity. Their Beneditti & Grigi Montefalco Sangrantino is a great wine with a seductive smoothness that shows how well they tame those infamous tannins. They also make a Sagrantino that does not adhere to the DOCg rules and so is labelled as IGT Umbria. It only has a little oak and is a fresh, lively and drinkable take on this tannic grape. Beneditti & Grigi wines are available, until Brexit anyway, from XtraWine, Tannico.co.uk and Uvinum – all of whom ship the wine to you directly and very efficiently – ah the joys of being in TheSingle Market. Liù Pambuffetti, winemaker and custodian of Scacciadiavoli’s history – photo by Quentin Sadler. Scaccadiavoli – The original innovator in Montefalco, this beautiful estate was founded in 1884 and created the recipe for what is now Montefalco Rosso. Amilcare Pambuffetti worked here as a young vineyard worker and was eventually able to buy the property in 1954 when he was 71. 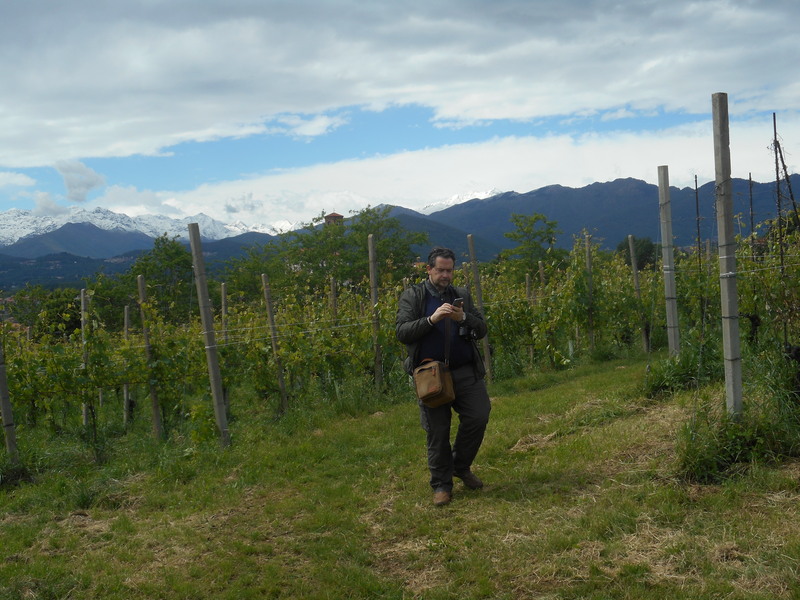 Today the fourth generation of his family farm 40 hectares of vines. Try: Their elegant Montefalco Sangrantino has a traditional, savoury character while they also make a fine traditional method sparkling rosé from 100% Sagrantino. Some Scaccadiavoli wines are imported into the UK by The Wine Society. Giampaolo Tabarrini, the force of nature behind Tabarrini’s success – photo by Quentin Sadler. 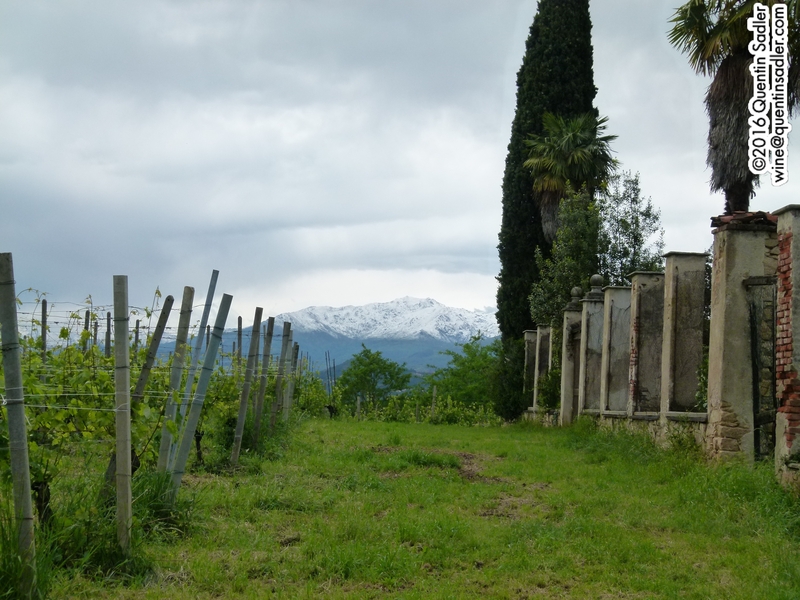 Tabarrini – Giampaolo Tabarrini, whose family have farmed here since the 1840s, is a true force of nature. He took his family winery that made local wine for everyday consumption and since 1996 has transformed it into one of the leading estates of this up and coming region. He is effortlessly charming, hugely entertaining and well worth listening to – which is good as he seldom keeps quiet, or stands still for that matter. 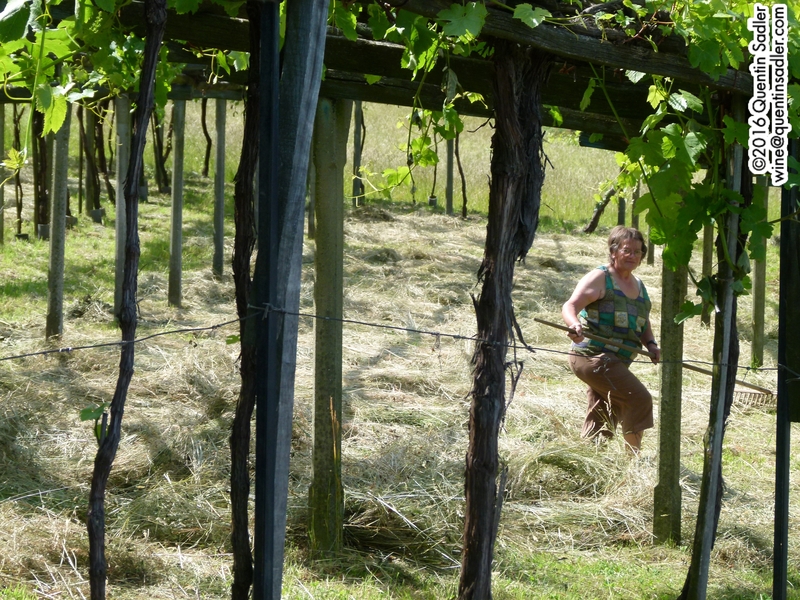 The farming is entirely organic and the focus is firmly on their 18 hectares of vineyard. Try: Adarmando Trebbiano Spoletana is made from hundred year old vines that are trained high up in trees, like wild vines, and is one of the very best white wines here. Giampaolo’s three single vineyard, or Cru, Montefalco Sagrantinos are exquisite with concentrated fruit, refined tannins and integrated oak. Tabarrini wines are distributed in the UK by Raeburn Fine Wines and are available from the excellent Uncorked and the equally first rate The Good Wine Shop. 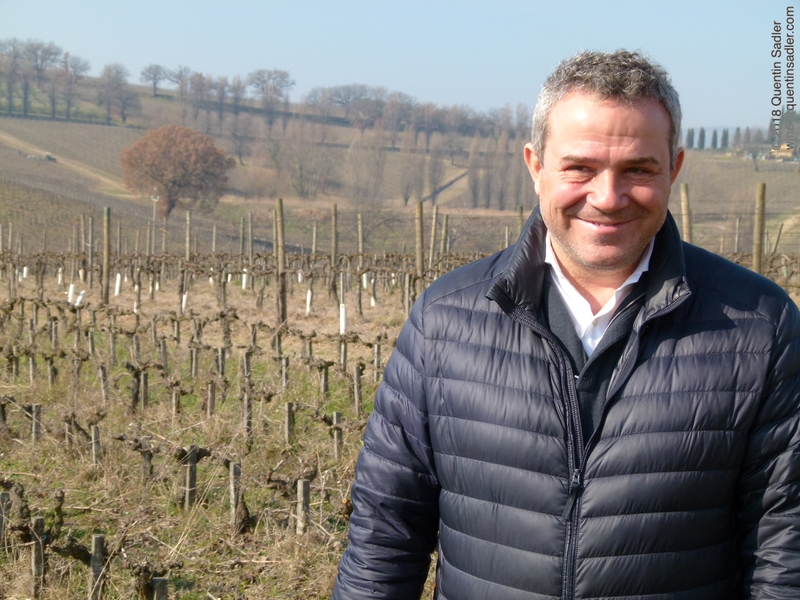 Valentino Valentini, the passionate and precise winemaker of Boale and Montefalco’s youngest ever mayor – photo by Quentin Sadler. 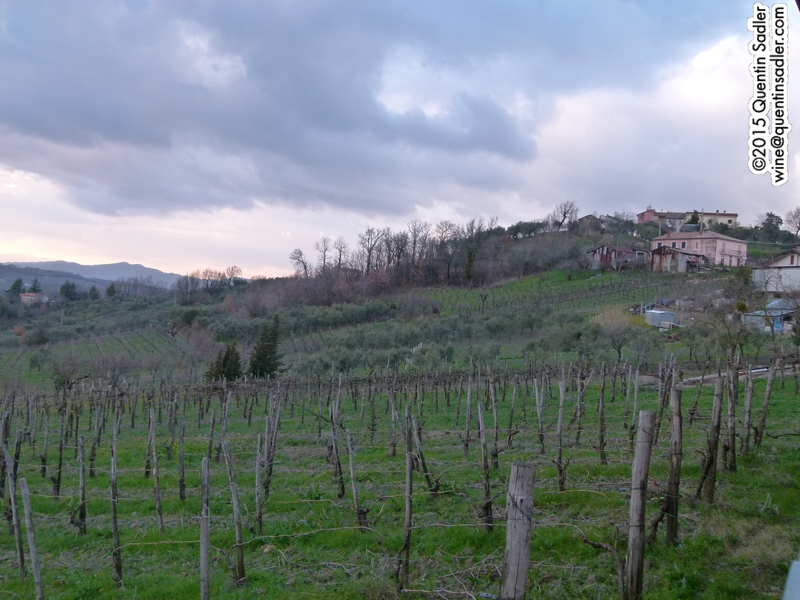 Bocale – The Valentini family have farmed in Montefalco for generations but only created their own estate in 2002. Now run by Valentino Valentini, Montefalco’s youngest ever Mayor, the emphasis is very much on quality. He makes true artisan wines that echo his passionate, yet precise character. The estate covers 9 hectares, farming is organic and all the fermentations are spontaneous. From 2009 they have picked later, for optimum ripeness, and aged the wines in large French oak casks to soften those tannins. Try: Their Montefalco Sangrantino is concentrated, spicy and herbal with nicely judged tannins that are firm but far from hard going. Bocale wines are distributed in the UK by Dolce Vita Wines and are available from Hedonism. 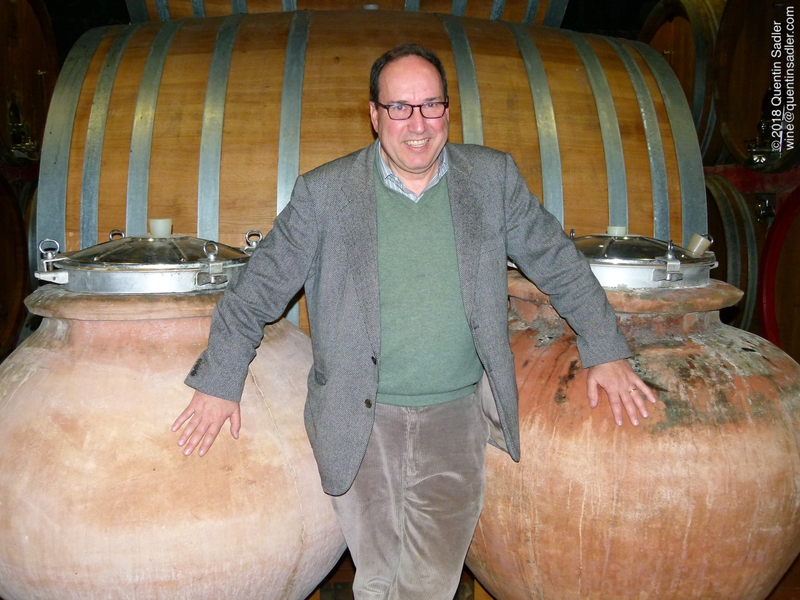 Filippo Antonelli, the charming and amusing owner of Antonelli with his amphorae – photo by Quentin Sadler. 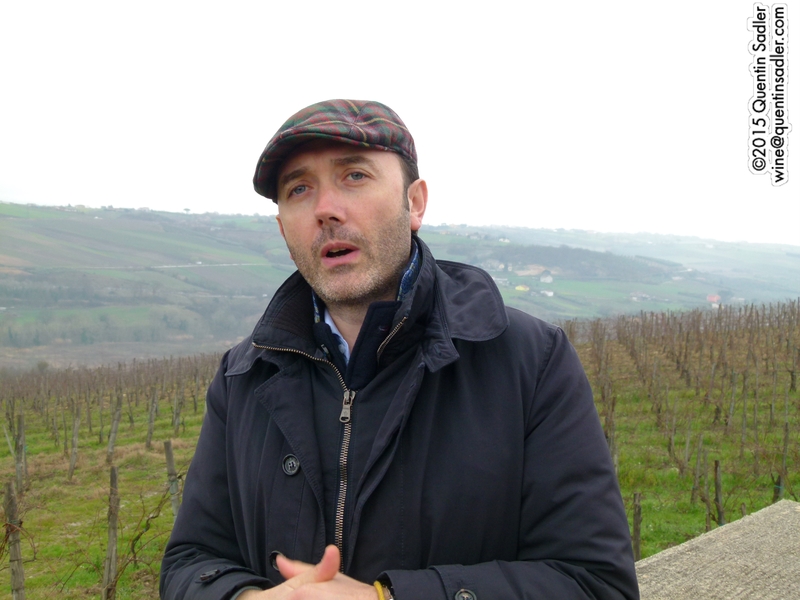 Antonelli – Filippo Antonelli is a fascinating and amusing host whose family has owned this estate since 1881. He himself has been in charge here since 1986 and seems justly proud of his wines and heritage. 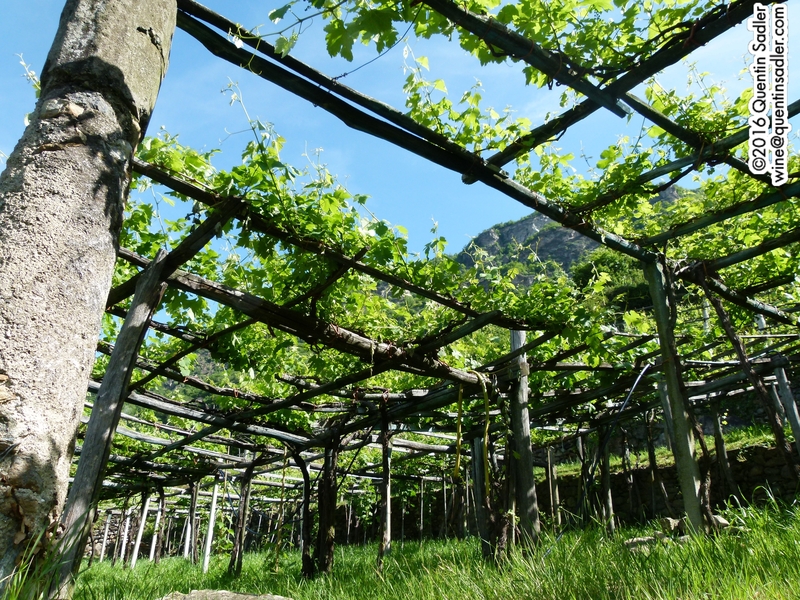 The vineyards cover 40 hectares and have been certified organic since 2012. Like many estates they also produce an amazing olive oil, as well as some wonderful salamis. Try: The magnificent amphora fermented and aged Anteprima Tonda Trebbiano Spoletana is one of my favourite white wines of the year. The single vineyard Chiusa di Pannone Montefalco Sagrantino is amongst the very best examples, while his Contrario Sangrantino is a juicy modern, unoaked take on the grape. Antonelli wines are distributed in the UK by Laytons and Jeroboams and are also available through Tannico.co.uk. 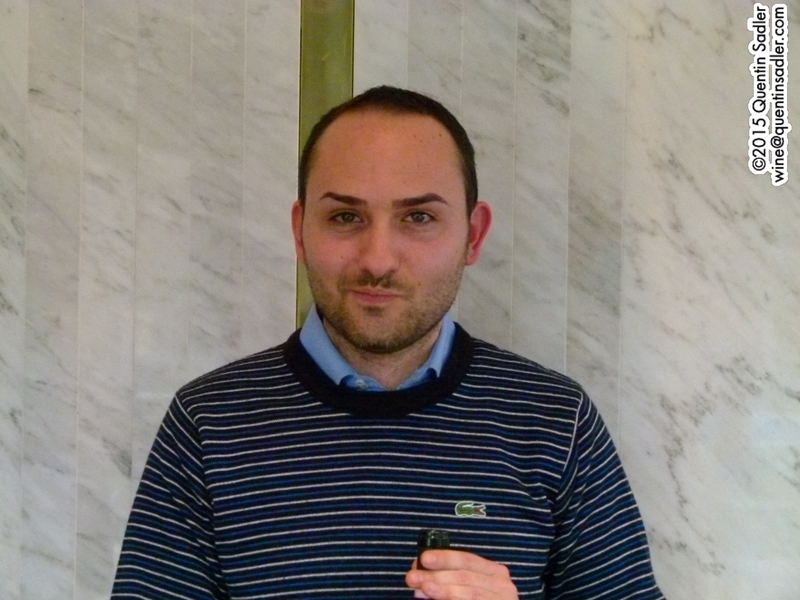 Albertino Pardi, winemaker at Cantina Fratelli Pardi – photo courtesy of Pardi. 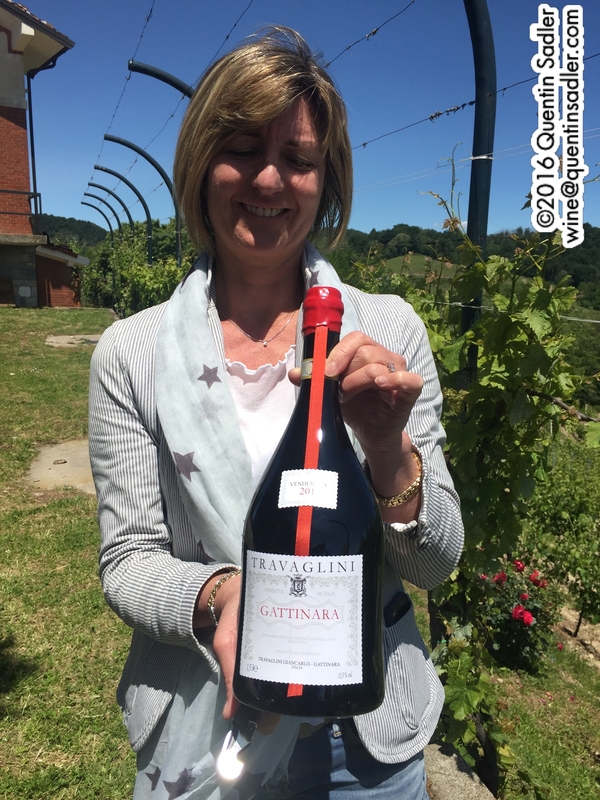 Cantina Fratelli Pardi – An 11 hectare family run estate that dates back to 1919, but produces a range of exuberant and bright wines that are modern in every way and yet true to themselves. Sadly I did not get to visit this winery, but I did taste their wines several times and seriously impressed by the quality and the sheer drinkability. Try: Their Trebbiano Spoletana, with its fresh acidity, touch of texture and tropical fruit, is an excellent introduction to this exciting style, while their Montefalco Sangrantino is complex and incredibly drinkable with its rich, concentrated fruit and supple mouthfeel. Pardi wines are imported into the UK by Aleksic & Mortimer Winehouse and are available through Tannico.co.uk. I seem to have become a bit obsessed by Italian wine of late and there is nothing wrong with that. The country has a great deal to offer, hundreds of indigenous grape varieties, dozens of wine producing areas, every imaginable style – some uniquely Italian – and everything from honest, everyday wine to some of the grandest fine wine producers in the world. 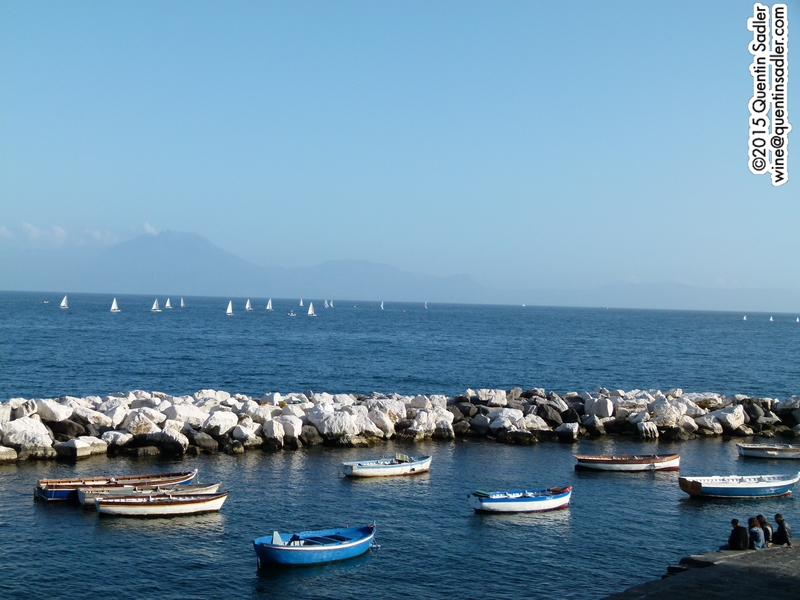 In the last couple of years I have enjoyed many trips to Italy and tasted many good – and great – wines. However recently I was invited to a wonderful wine dinner and tasting in London as a guest of Baron Francesco Ricasoli, one of the grandest Italian producers of them all. Brolio Castle and some of its vines. 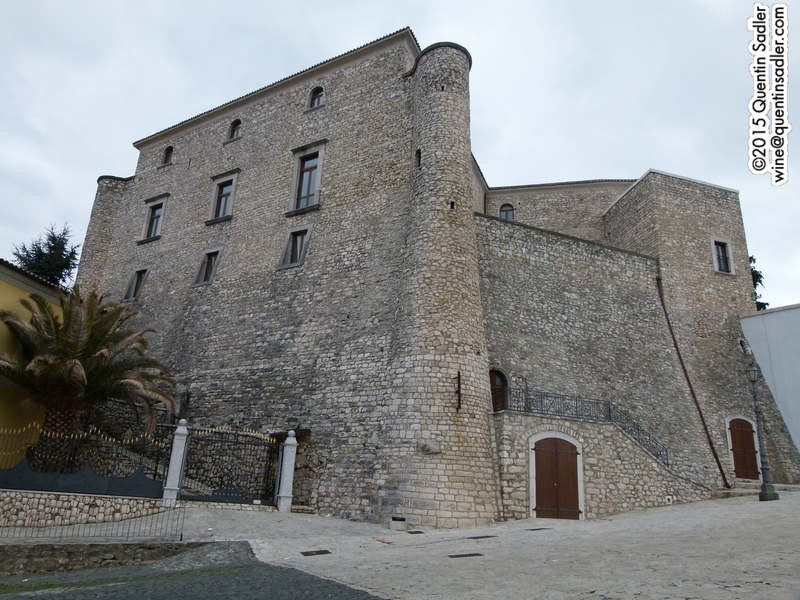 The Ricasoli family are very old and emerged as feudal lords from Lombardy in the times of Charlemagne. They settled in Tuscany in the area now known as Chianti – perhaps it was then too as the name is thought to be that of an Etruscan family – more specifically what is now the Chianti Classico. The family took ownership of Brolio Castle in 1141 and have been there ever since, which makes them officially the oldest winery in Italy – quite an achievement when you consider that the castle marked the border between Florence and Siena. I found it extraordinary to be having dinner and chatting away with a man whose direct ancestors would have had dealings with the Medici family and be involved in the intrigue and violent politics of Florence in the Renaissance. From a wine point of view though his most important ancestor, in modern times anyway, was Bettino Ricasoli, 2nd Baron Ricasoli. Born in 1809, Bettino eventually became the Tuscan Minister of the Interior and was instrumental in pushing for the union of Tuscany with the Kingdom of Sardinia (Piemonte) that took place in 1860 and established the Kingdom of Italy. He went on to serve two terms as Prime Minister of the newly unified Italy. 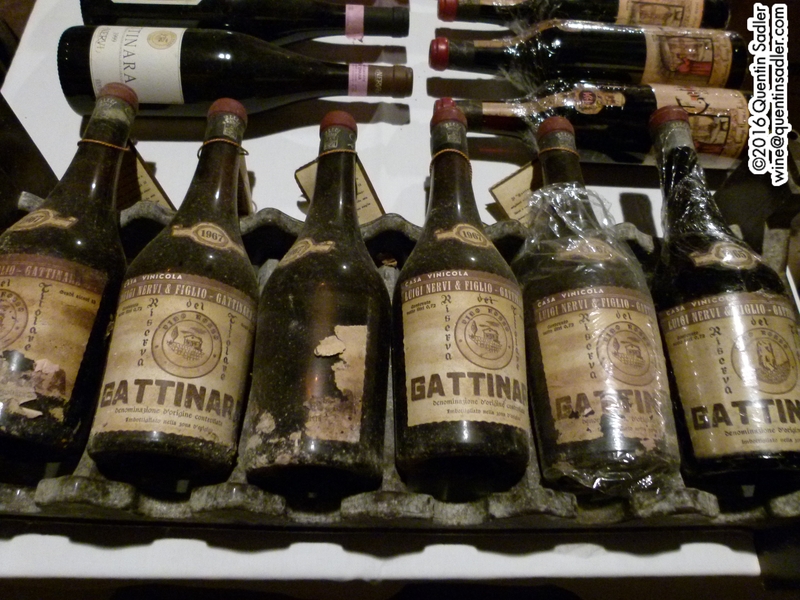 As if that was not enough for one lifetime, Bettino also made an enormous contribution to the history of Chianti. Wine map of Tuscany showing the location of Brolio Castle – click for a larger view. The wine had been around for centuries, indeed Henry VIII was known to drink it, but originally it was only made in the area called the Chianti Hills just to the north of Siena. Indeed the Grand Duke of Tuscany, Cosimo III de’Medici, issued an edict creating the boundaries of the region which today broadly correspond with those of modern Chianti Classico. 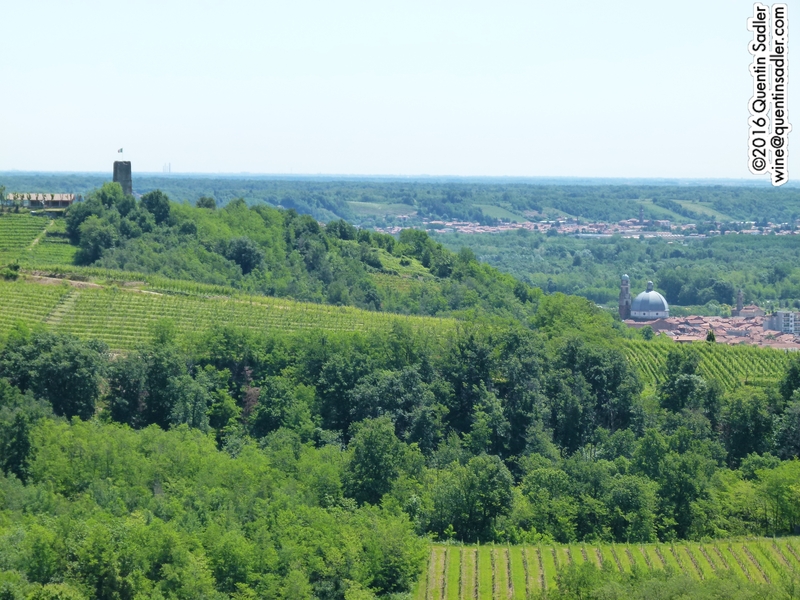 Brolio is at the heart of this region, in Gaiole in Chianti some 10 km north east of Siena. The idea of what constituted a Chianti wine seemed to be somewhat fluid in those days. Indeed there is some evidence, as with Rioja, that it was a white wine in the past. It was not until Bettino had finished his stint as Prime Minister that he was able to bring some clarity to what Chianti actually was. 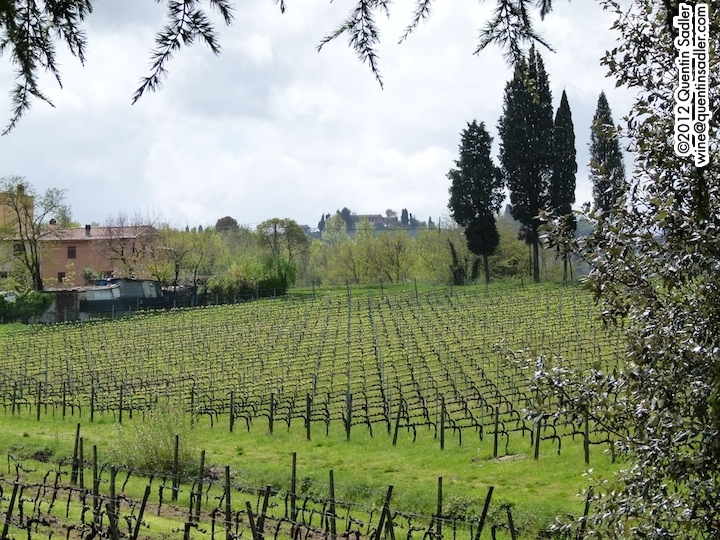 He had worked very hard at restoring the Brolio estate, replanting and experimenting with what grape varieties really suited the land and making the best expression of Chianti that he thought possible. In the end he settled on a blend of three grapes, Sangiovese, Canaiolo and Malvasia, or Sangioveto, Canajuolo and Malvagia as they were known back then and sometimes still are locally. Just as an aside, in those days it was normal to grow lots of grapes together, to pick them together and to vinify them together too as a field blend. Such wines that included white grapes were much paler and lighter than most red wines of today. I was fortunate enough to taste a wine made in this fashion at Thomas Jefferson’s estate in Monticello, Virginia and it was a real eye opener to wines of the past. I find it fascinating that even then he knew the Malvasia diluted the wine – softening it to make it drinkable – and could be left out if you wanted to age the wine instead. Malvasia is no longer a permitted grape for Chianti – although it is still grown in the region for other wines – all the grapes used in Chianti must now be black. Today the estate is the largest in Chianti Classico – 12000 hectares in total with 236 hectares of vines and olive trees and it might all seem rosy, but that is only because of a great deal of hard work and foresight. The charming Baron Francesco Ricasoli. In the 1960s the Ricasoli family sold their name, their brand, to Seagrams. They managed the vineyards and sold the wine to Seagram who marketed it around the world. It may seem strange today, but at the time it made total sense. Many fine wine regions were struggling, astonishingly both Chablis and Côte Rôtie almost disappeared at that time, and Chianti was going through a hard time too. 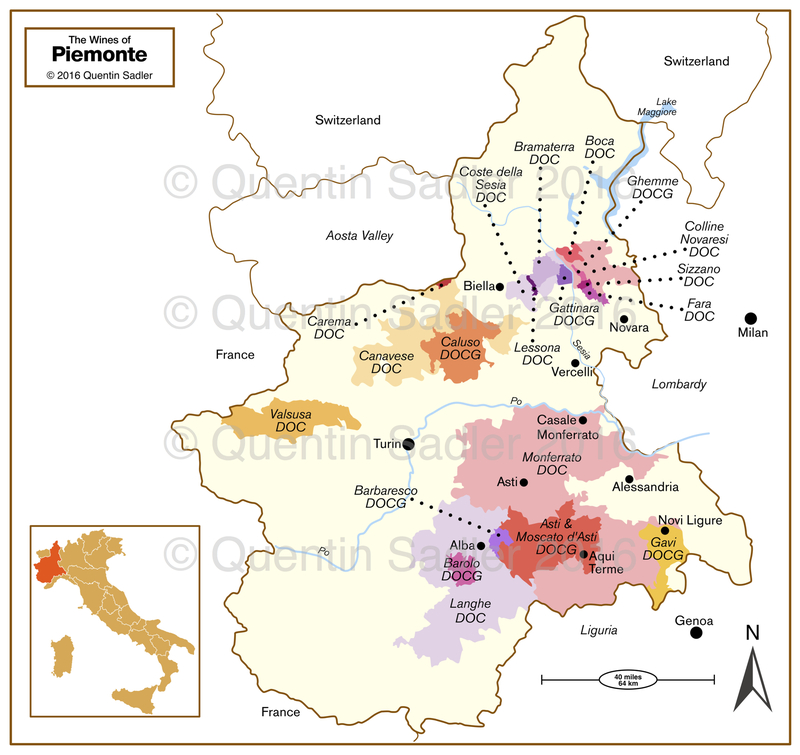 The wines had lost their reputation for quality and many producers had lost confidence in their grapes and their land – this was the time when some Chianti makers saw their future in Cabernet and Merlot and the ‘Super-Tuscans’ were born. The Seagrams deal saved them at the time, but undermined their history and reputation. 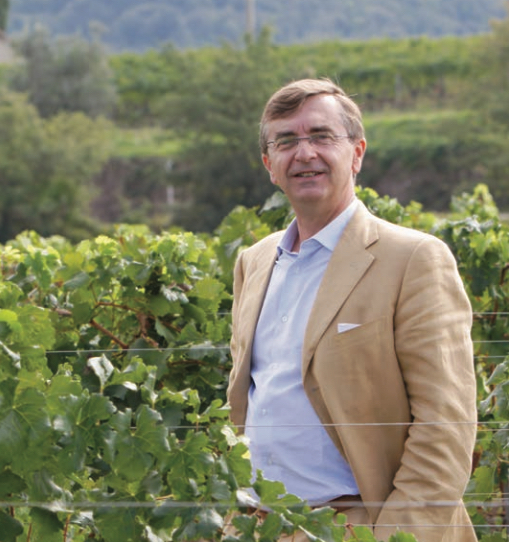 Baron Francesco Ricasoli took over the family business in 1990 and decided to put that right. The first thing he did was extensive replanting to ensure the quality came right in the vineyard. Then when Seagrams sold out to Hardy’s in 1993 he was able to buy the family brand back. From then on the focus has been on quality and re-establishing the prestige of their brand. Francesco was not a winemaker by trade, but a professional photographer, so since 1990 has been operating outside his comfort zone in many ways – although frankly it doesn’t show. He is assured, charming, deeply knowledgeable about his land and I could have listened to him forever. He introduced his wines with modesty and was keen to emphasise that he had built a team to make this project work, but you could hear the pride in his voice when he told us that in 20 years Ricasoli went from being almost forgotten to being regarded once more as a great estate. Key to the progress they have made with their wines is their zoning project. 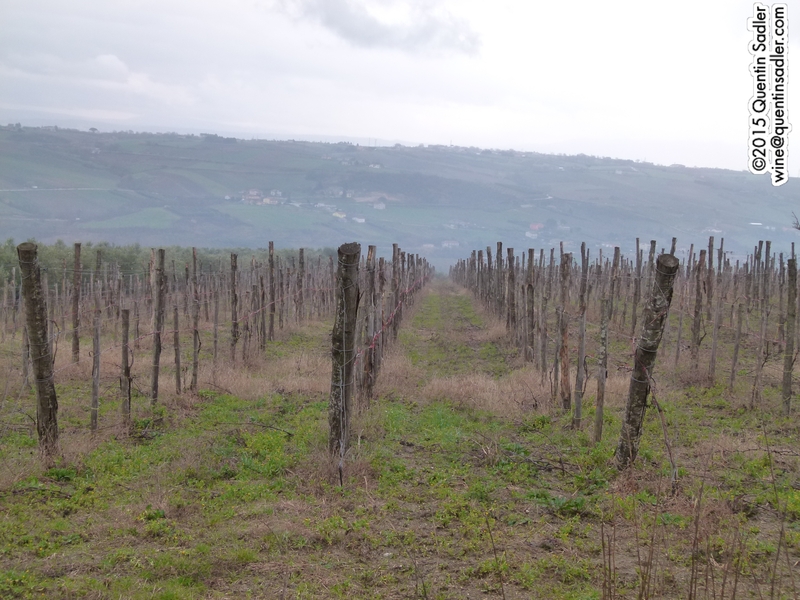 This is a study in collaboration with the Experimental Institute for the Study and Protection of the Soil in Florence, which is mapping each parcel of vineyards by soil and climate to ensure that the correct grapes varieties are planted where they should be and on the most suitable rootstock. The tasting was held at Pied à Terre in Charlotte Street in London and the food was an exquisite backdrop to these wonderful wines. This was our aperitif and it was a blend of 75% Chardonnay blended with 25% Sauvignon Blanc. The Chardonnay was aged for 9 months in used barriques and tonneaux on the lees. the sauvignon was aged on the lees in stainless steel for 9 months. This was a terrific wine with a lovely, beguiling, balance of richness and texture with freshness, acidity and minerality. I have had a few wines over the years that blend these two grape varieties together and they always seem good to me, so I often wonder why more people don’t don’t do it. This example is very fine – 91/100 points. Fareham Wine Cellar and Slurp. A single vineyard Super-Tuscan wine that has been produced since 1993. It was originally pure Sangiovese, but is now 100% Merlot. The vineyard is south facing and the soil is chalky clay. The different blocks were aged for between 18 and 21 months in French oak barriques and tonneaux before blending. I am not always a fan of Merlot, but this was delicious stuff. The colour was deep, vibrant and plummy, while the lifted nose offered mocha, chocolate, plums and coffee with a touch of earth and even a whiff of the Mediterranean. The palate was smooth, creamy almost with light grainy tannins, vanilla, rose hips, plums and a dusting of cocoa. The flavours really build in the mouth and it is very long. It was a great match – 92/100 points. Tannico and Just in Cases. This was the last vintage that blended 30% Merlot and 70% Sangiovese together, from 2007 Casalferro has been pure Merlot. The wine was aged for 18 months in French oak barriques. Beginning to show its age with a tawny rim and a briny, balsamic dominated aroma together with leather, earth, dried fruits and strong coffee. The palate was very soft, yet savoury and earthy with something almost medicinal about it. The tannins and the fruit were smooth and velvety and the acidity, presumably from the Sangiovese, kept it youthful and bright. This was magnificent with the quail meat, especially the crispy roast quail legs – 93/100 points. This wine, now labelled as Gran Selezione – the first eligible vintage was 2010, is the Grand Vin of the estate. Gran Selezione is an attempt to firm up the quality credentials of top Chianti Classico. Historically the Riserva wines were the pinnacle of production, but normal Chianti Classico could be aged longer in wood and be labelled as a Reserve, so nothing really set the wines apart as being great quality. Gran Selezione wines must be made from estate grown fruit, not bought in. The minimum alcohol must be 13% compared to 12.5% for Riserva. 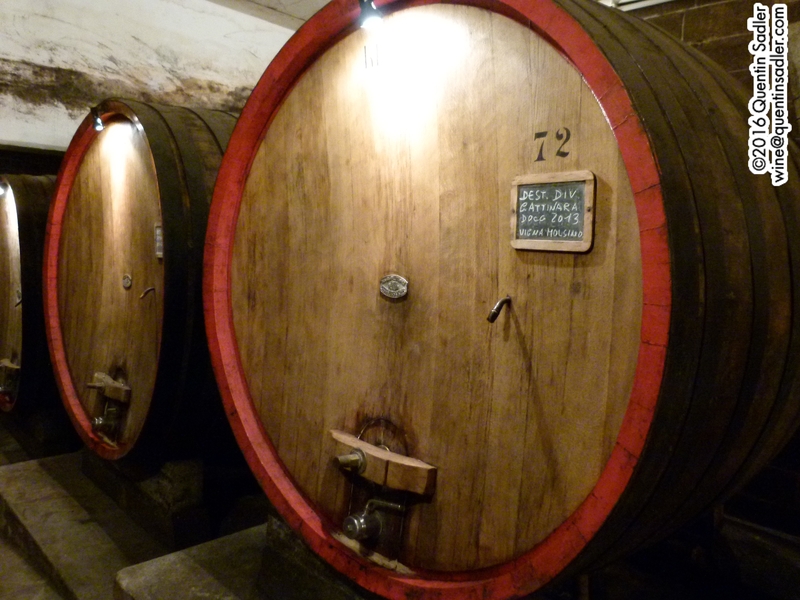 The wine must be aged for 30 months, compared to 24 months for Riserva. There is some controversy around the adoption of this new system, but I can see the point of it. This 90% Sangiovese, 5% Cabernet Sauvignon and 5% Petit Verdot blend is made from a very careful selection of the best fruit on the estate, fermented in stainless steel then aged for 21 months in French oak barriques and tonneaux – 20% new. The nose offered bright plums and pomegranates together with rich earth and mocha notes. The palate was supple, youthful, joyous and delicious with fine grain tannins, sweet red fruit and a harmonious feel. I could drink it now, but it really needs time – 94/100 points. Waitrose Cellar, Tannico and Millésima. This 80% Sangiovese, 10% Cabernet Sauvignon and 10% Merlot blend is made from a very careful selection of the best fruit on the estate, fermented in stainless steel then aged for 28 months in French oak barriques and tonneaux – 20% new. 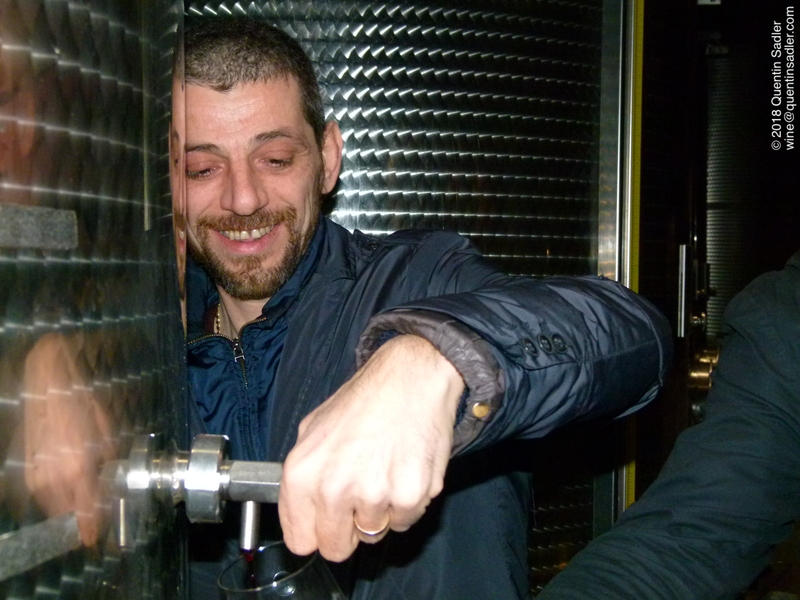 2008 is not considered a great vintage, but Francesco is very fond of it and wanted to share it with us. I am glad he did, I thought it was terrific. The age is beginning to show here with more toffee, caramel and balsamic, soy sauce and general umami note The palate was very supple, very smooth with nice freshness, dried fig fruit, mushrooms, smoky coffee and caramel flavours. The finish was long, savoury and saline with a touch of mocha and cedar too. A beautiful wine ageing gracefully – 93/100 points. One of the hottest vintages to date, this was a blend of Sangiovese with a little cabernet sauvignon. The wine was aged for 18 months in French oak barriques – 65% new. The age shows here, but it is very good. the nose is earthy, mushroomy, truffles, meaty, dried figs and rich coffee, even a touch of stout on the nose. The palate is again very supple with sweet dried figs, almost no tannins and a meaty, savoury richness that makes it great with food – 93/100 points. This wine is a site specific, pure Sangiovese Chianti Classico that is now labelled as a Gran Selezione. In effect it is a Cru from a vineyard on the estate that sits at 380 metres above sea level and faces south west. 100% Sangiovese made from a very careful selection of the best fruit on the estate on the Colledilà block, fermented in stainless steel then aged for 21 months in French oak barriques and tonneaux – 40% new. I am not always wowed by the top wines of an estate, but this really seduced me. What’s more it was from a difficult vintage with lots of hail. It was fragrant, floral, perfumed with sweet red fruit, mocha and a touch f tobacco. The palate was smooth, supple, smoky with fine grain tannins, ripe red fruit and a beautifully fresh, lightly flesh and succulent mid weight to it. This was stunning wine and I would add that the label is utterly beautiful too – 95/100 points. 100% Sangiovese made from a very careful selection of the best fruit on the estate on the Colledilà block, fermented in stainless steel then aged for 18 months in French oak barriques and tonneaux. Showing some lovely bottle age, this is much more savoury and meaty with dried fruit, walnuts and coffee aromas, even some toffee. The palate is wonderfully cohesive with an underlying freshness balancing the richness and binding it all together. The tannins are supple and there is a dried fruit and savoury, earthy flavours and a sense of purity about it that makes it sing. It was magnificent with the Comté – 93/100 points. This blend of Malvasia and Sangiovese is made from late harvested grapes that are then dried over the winter to concentrate the sugars further. 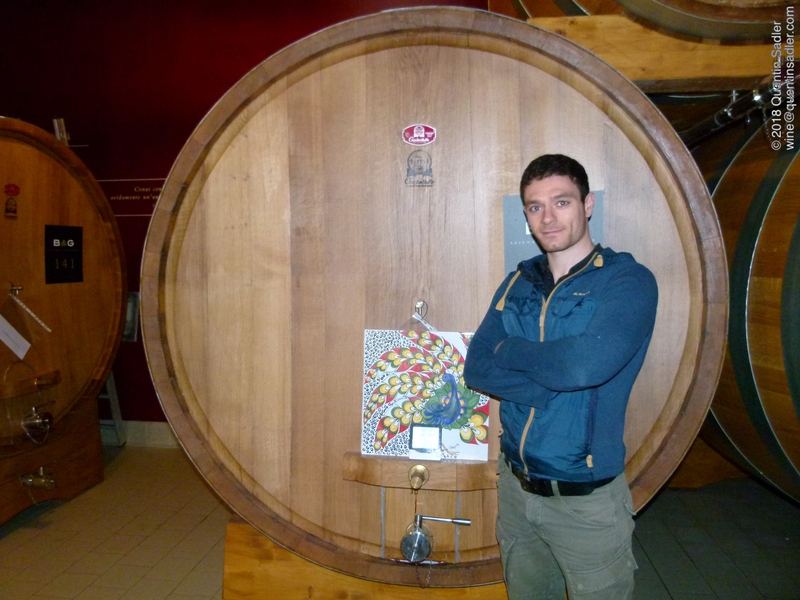 The juice is then fermented and the wine then aged for 4-5 years in French oak barriques. This was the colour of Malt Whiskey and had a nose of cinder toffee, caramel, oranges, dried apricots together with a whiff of old books, leather, pipe tobacco and coffee. The palate is a wonderfully sumptuous blend of sweet and sour with chestnut, coffee, dried fig, maple syrup and concentrated apricot fruit. The finish is firm and surprisingly unsweet with great acidity and balance. The end is almost savoury and salty with reminders of Sherry, Sauternes and Madeira on the nose and plate – 93/100 points. The whole evening was a memorable experience of good company, excellent food and magnificent wines. If you want to see what Chianti can be, do try one of the wines from Castello di Brolio Barone Ricasoli, they are quite a revelation. 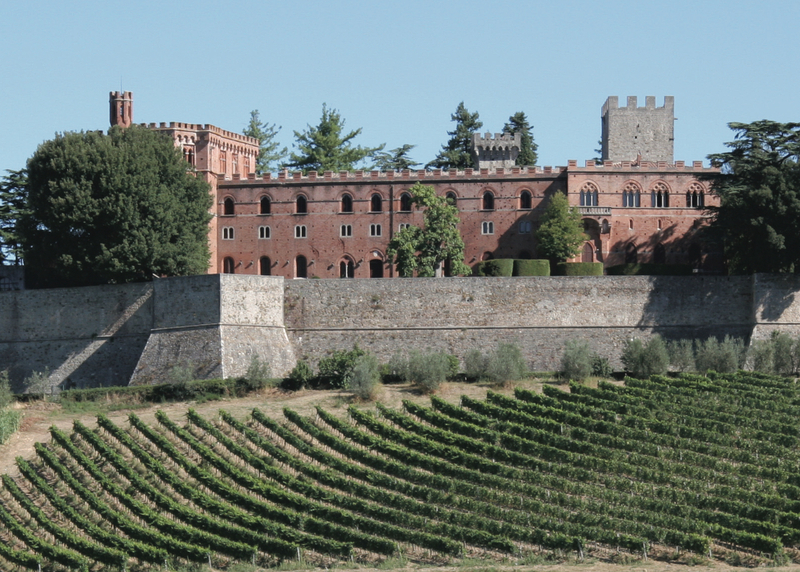 The wines that I have written about here are the pinnacle of Barone Ricasoli’s production. If you want to dip a toe in the water and try their wines without quite such a large price tag, then they make many other wines including their superb Barone Ricasoli Brolio Chianti Classico Riserva, their excellent Brolio Chianti Classico – also here – and the Waitrose in Partnership Chianti Classico, which is very good and great value for money. Barone Ricasoli wines are imported into the UK by John E Fells. 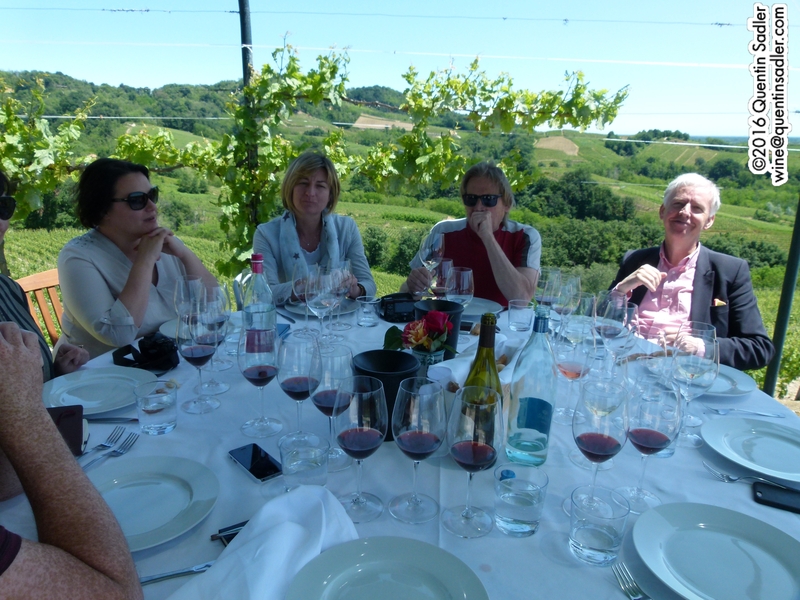 A few weeks ago I was on a wonderful trip to the Marche region of Italy, some of you will have read Part 1 of my thoughts on the trip, well here is Part 2 and it focuses on a couple of producers whose red wines really stood out for me. Beautiful vineyards in the Marche. 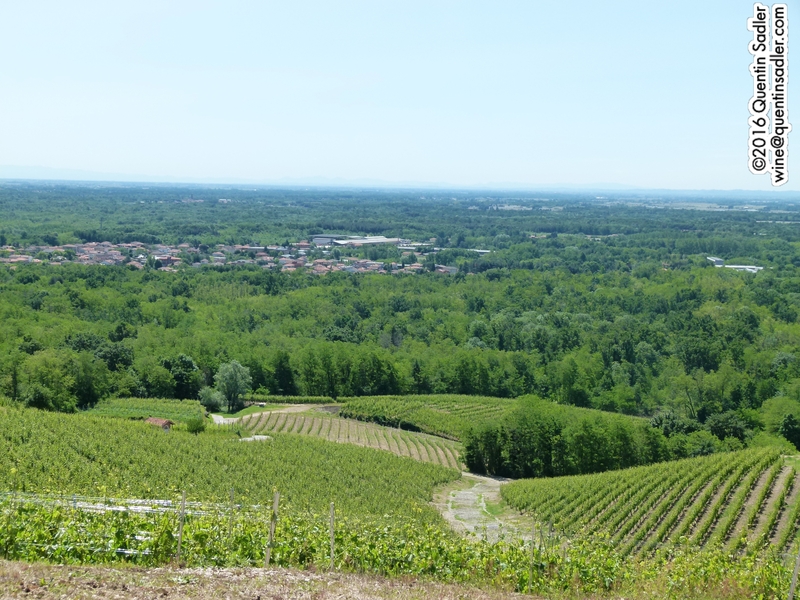 I saw so much that excited me on my trip to the Marche, it is a beautiful landscape with much to enjoy and incredible variety, borne out by the many different wine styles. 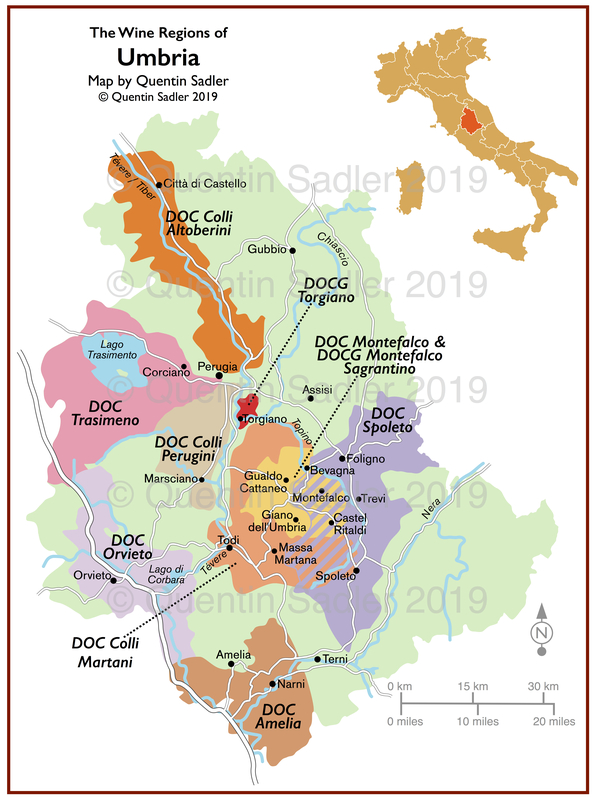 However it is the quality of the DOC Verdicchio dei Castelli di Jesi whites and the lesser known, in the UK anyway, Cònero Rosso DOC and Cònero Riserva DOCG that must be the region’s vinous calling cards. I was hugely impressed by the modern examples of Verdicchio dei Castelli di Jesi, they were totally different from the thin and harshly acidic wines of my youth. In truth I had no idea what to expect from the reds, so really enjoyed the experiences of tasting the wines. They were so varied, from deliciously fruity and modern wines, to rich and powerful examples and refined elegant wines. It seems there is something for everyone here. We tasted good red wines at pretty much every where we went, but these are the ones that moved me the most. The main grape in the Marche for red wines is Montepulciano and the most important wine that it is used for is Rosso Cònero DOC and it’s big brother the Cònero Riserva DOCG. Both of these must contain at least 85% Montepulciano and can have up to 15% Sangiovese. Montepulciano is a grape that struggles with its image I think. 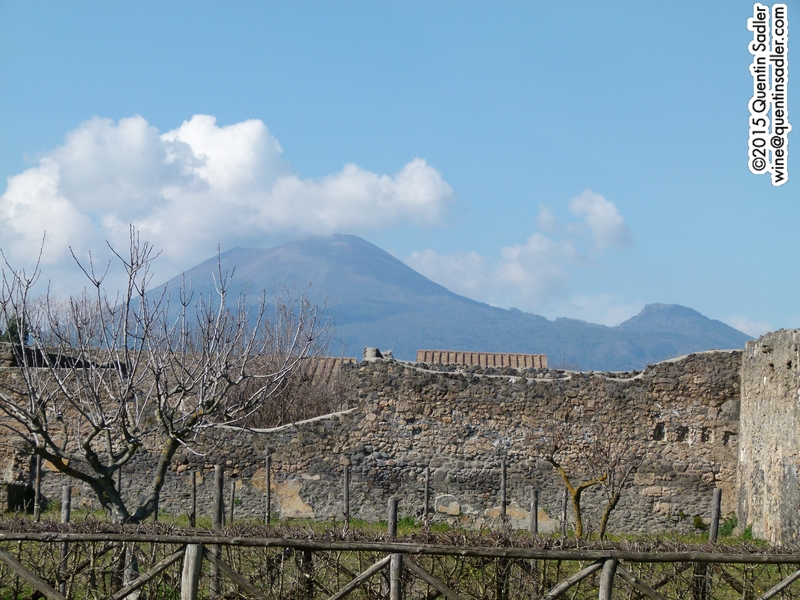 For a start there are the cheap and cheerful wines from Montepulciano d’Abruzzo. I know there are good wines made down there, but most of the examples that we get are somewhat jammy and easy drinking. Well most of the Rosso Cònero and Cònero Riserva wines that I tried were nothing like that. They were very enjoyable to drink, but they were layered and complex wines that really excited me. 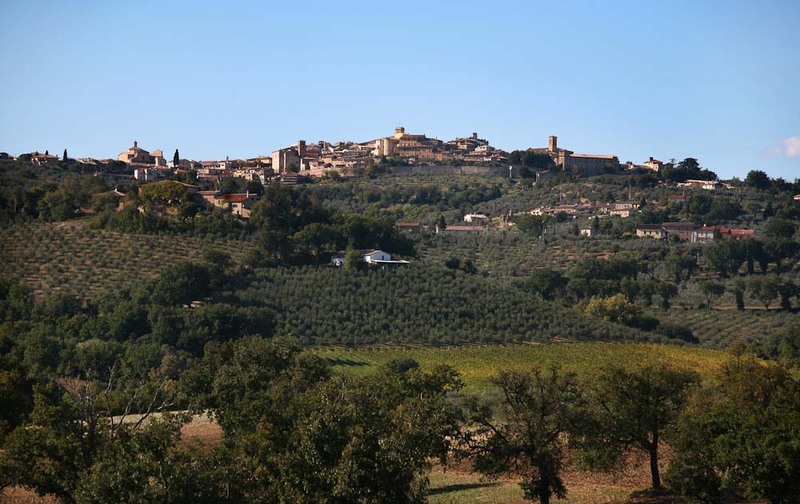 The other problem for Montepulciano, which can cause confusion, is that in Tuscany there is a town of that name that produces a wine called Vino Nobile di Montepulciano from Sangiovese grapes. I was really astonished by how good these Cònero wines were and very disappointed that are very hard to come by in the UK. 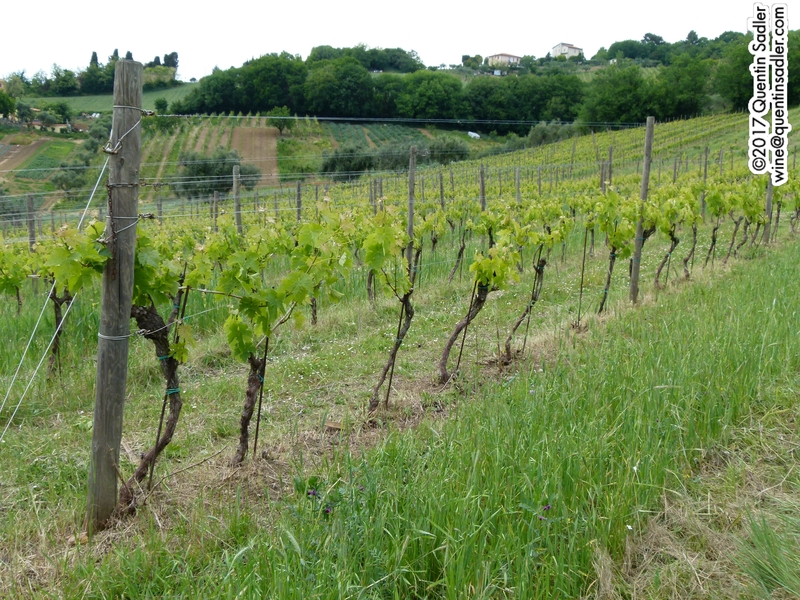 Cònero DOCG covers the same area, but has lower yields and is aged for at least 2 years. 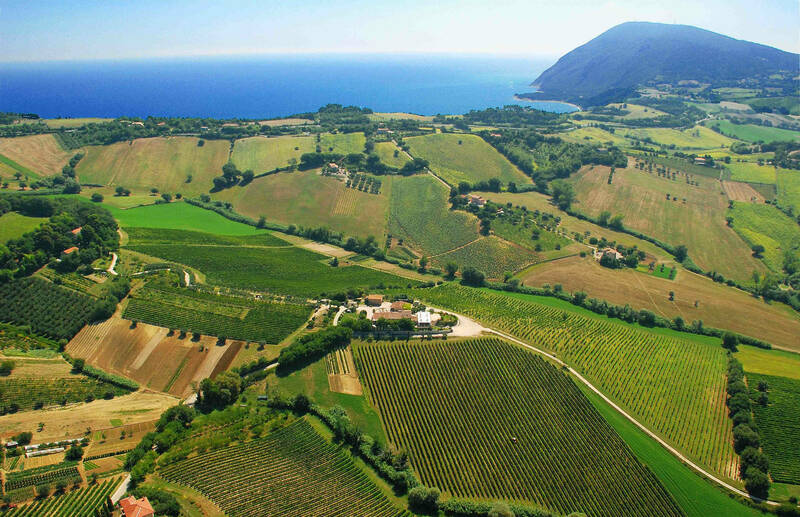 Fattoria La Terrazze from the air showing the proximity to the sea – photo courtesy of the winery. 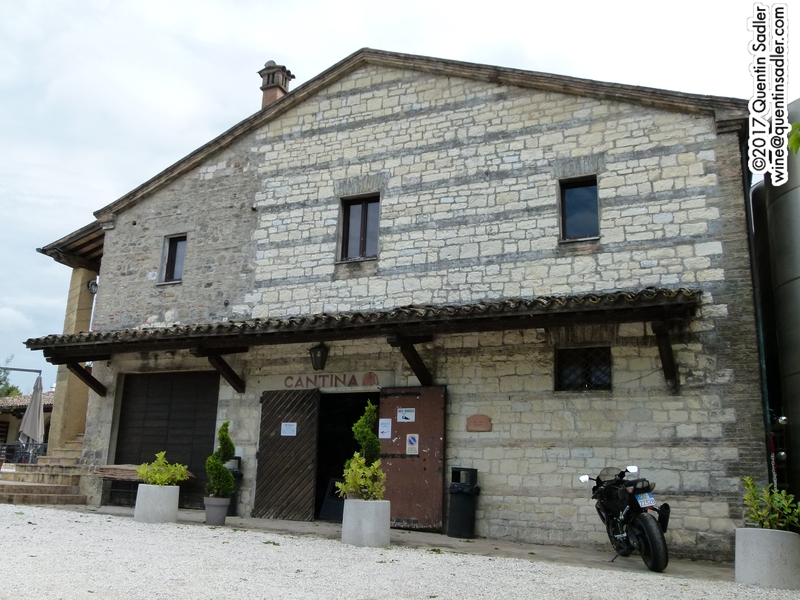 My second winery visit in the Marche was to Fattoria La Terrazze in the Rosso Cònero area. 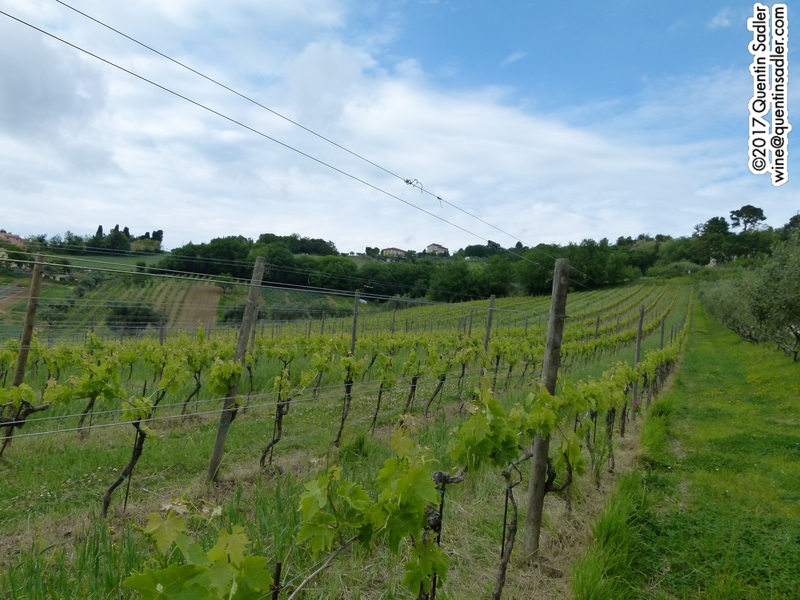 The setting is so lovely, 10 km or so to the south of Ancona and only a kilometre or so inland from the Adriatic Sea and Mount Conero which gives this small wine area its name. 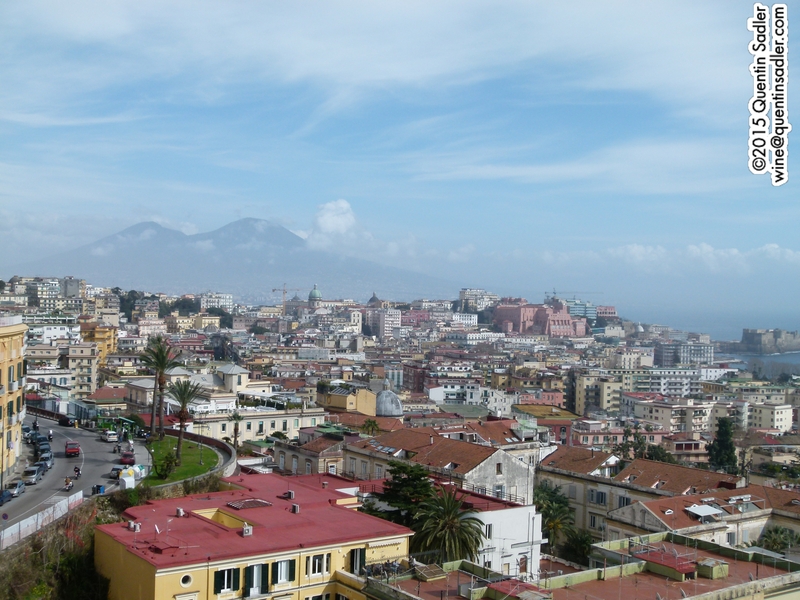 The mountain is a promontory to the south of Ancona (there is a slight bulge out into the sea on my map) and is the only high point on the east coast of Italy and at 572 metres it really stands out. In ancient times it must have been a welcoming marker to tell sailors that they had made it safely to Ancona. The estate has been here since 1882 and is still owned by the founding Terni family, although its reputation is all recent. 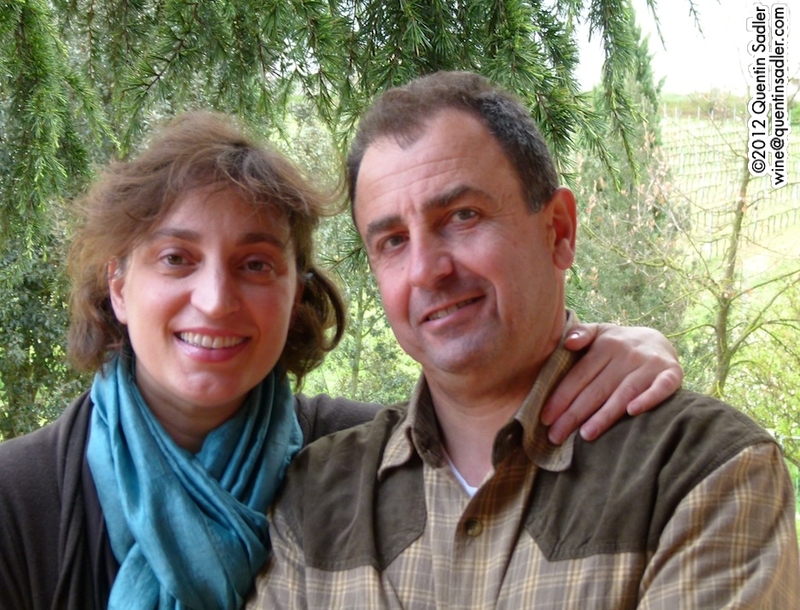 Today it is run by Antonio Terni and his charming English wife Georgina. I liked them, their beautiful winery and all the wines. 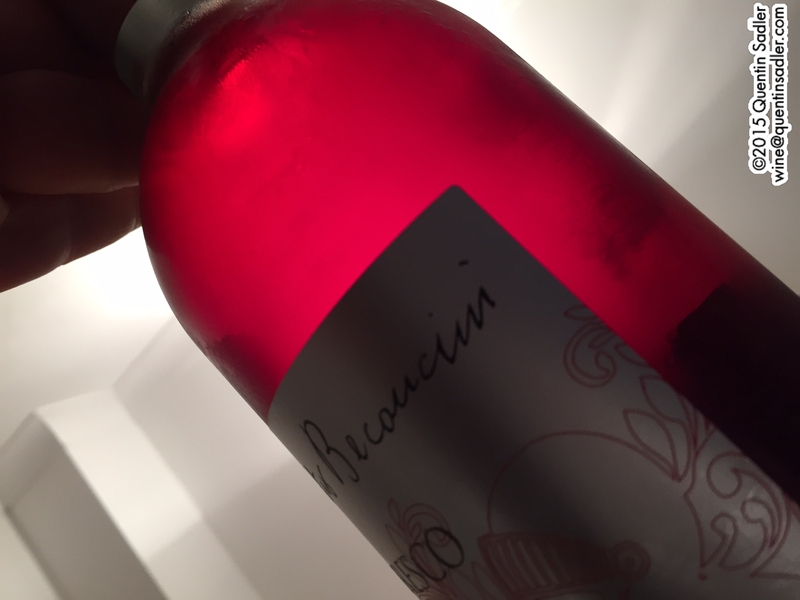 Antonio is something of a music fan and his rosé is rather memorably called ‘Pink Fluid’. 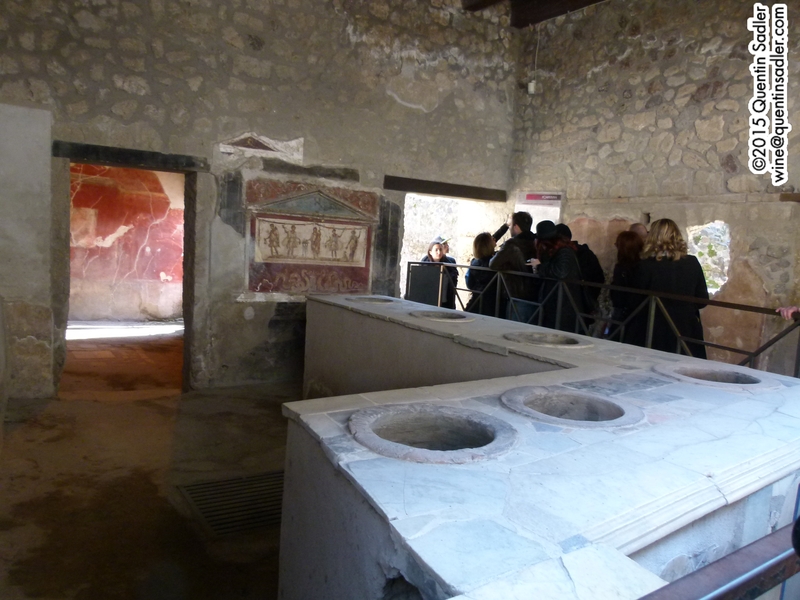 We even tried his bulk wine that is sold to the locals by the litre – they bring their bottles and jars to be filled. The red was a Montepulciano and the white was a Chardonnay and they were very nice, drinkable wines, however, some of his finer products really stood out. 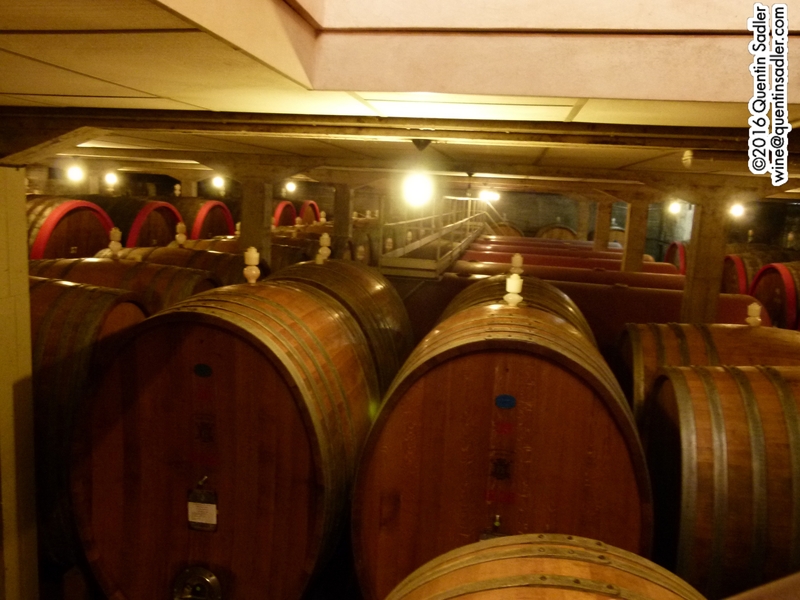 100% Montepulciano grapes are fermented in stainless steel and then aged in huge, 2000-4000 litres wooden barrels for 15 months. The colour was a mixture of damson and dark cherry, while the nose gave off wild fruit of the forest and light smoke notes together with something a little salty or soy sauce-like. The palate is medium weight with nice acid balance, herbal flavours, salty, mineral and spicy flavours and some coulis like brambles fruit together with a very long finish. I liked this a lot. It was my first wine of the region that I can remember tasting and it was pretty impressive, a worthy alternative to Chianti or something like that – 89/100 points. 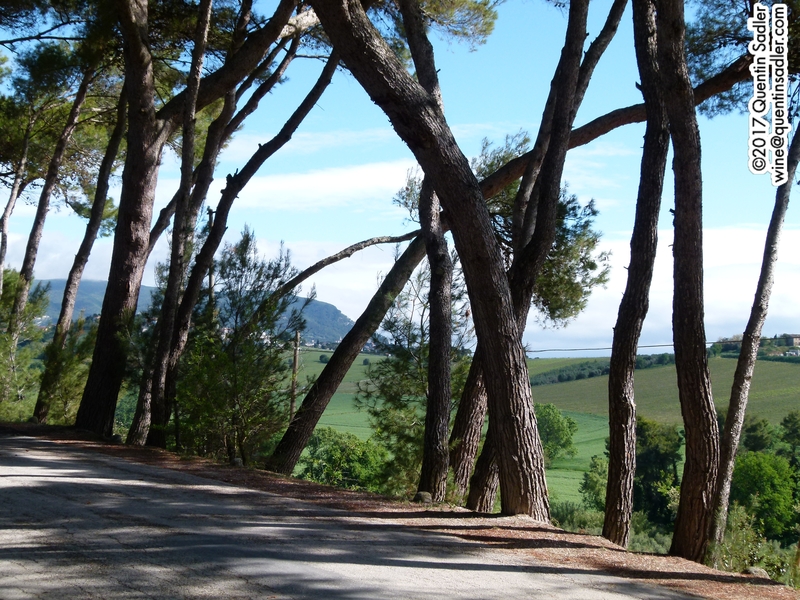 The road to Fattoria La Terrazze, that is Monte Cònero and the sea in the distance.. This wine is named after a beach below Monte Cònero which is called black or neri because it is covered in mussels. This is also 100% Montepulciano grapes that are very carefully selected for this wine, picked later and riper are fermented in stainless steel and then aged in 225 litres wooden barrels for 18-24 months depending on the parcel of fruit. It is also aged for a further 6months in bottle before release. The colour was attractive, deep, and plummy. The nose was earthy, smoky and savoury in a really attractive way. Then the palate was rich and intense with smoke, herbs, sweet liquorice, a sweet and sour umami thing, rich cooked dark fruit, spice and some pretty big, drying chalky tannins in a good way. My I liked this, it really is beautifully made – 91/100 points. Antonio also shared bottle of the 1998 Sassi Neri with us. This was much more developed with more prune-like fruit, fig notes, dried raspberry, as well as rich umami, coffee,muchroom and salty flavours on the lovely finish. Some of the Fattoria La Terrazze wines are available in the UK from Tannico.co.uk and Italvinus. 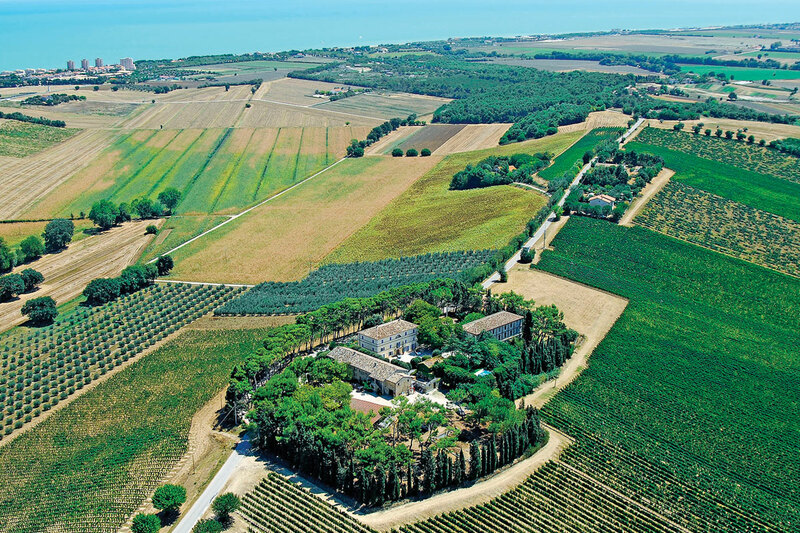 Aerial view of Azienda Agricola Moroder -photo courtesy of the winery. 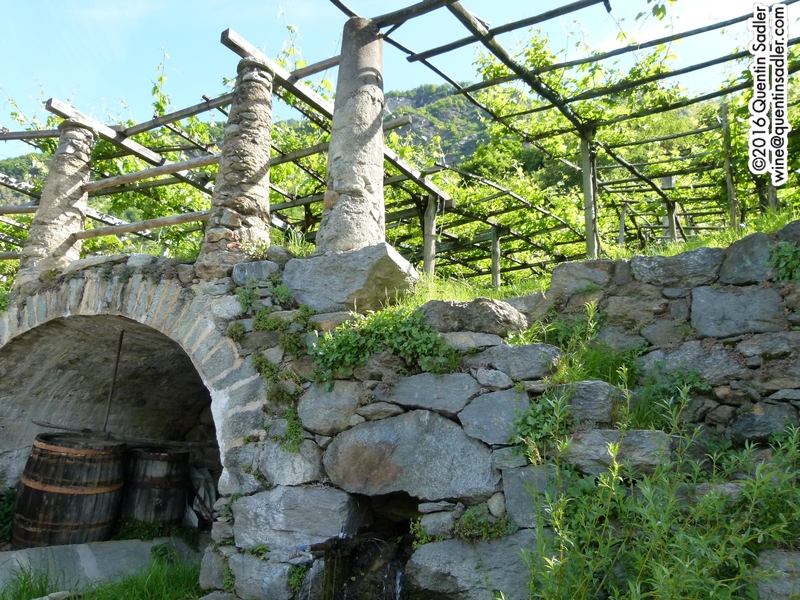 Azienda Agricola Moroder is another winery in a magnificent setting. It’s in the middle of Conero National Park, just 5 km inland from the Adriatic Sea and the glorious Mount Conero which gives this small wine area its name. 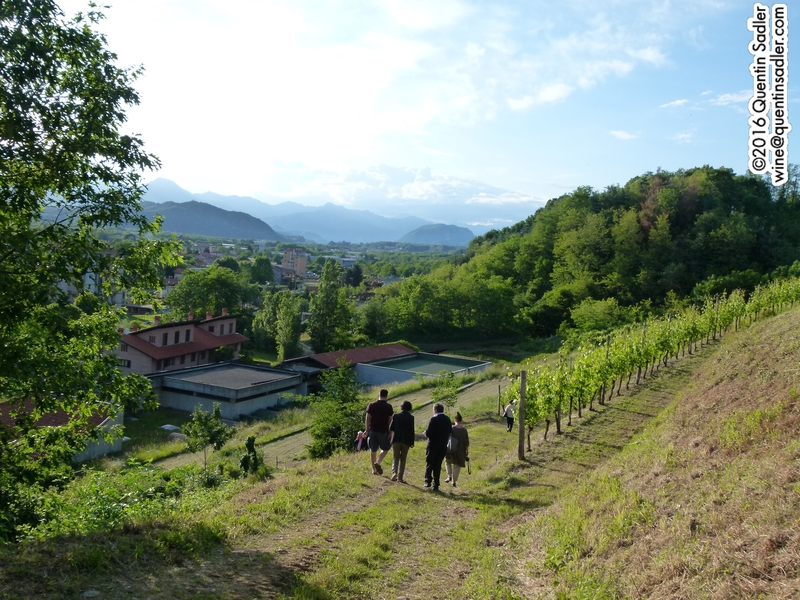 The estate today is run by Marco and Mattia Moroder whose family have owned the site since the late eighteenth century, but who turned it into a dedicated winery in 1837. The winery is still in the cellar of the beautiful original farmhouse. The Moroder name is actually Ladin and Germanic and originates in the South Tyrol, indeed the brothers told us that Giorgio Moroder is a relative. They also explained that the name came from bands of fighting men who were left behind, making it strikingly similar to ‘marauder’ in English. The cellar dates back to 1700 and was originally used as an ice store and to keep food in good condition. 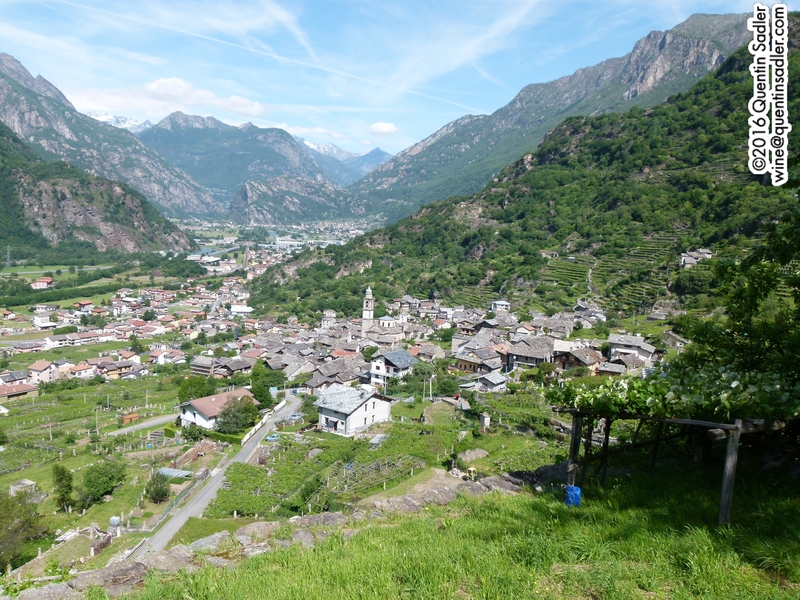 Although they have a long history here, their reputation is much more recent and Marco and Mattia’s parents, Alessandro and Serenella Moroder can pretty much be credited with revitalising the red wines of the area. The estate has a huge terrace with beautiful views out over the vineyards making it seem very restful. It covers some 120 hectares, but only 50 are planted with vines. The rest being forest, olives and fruit trees, all of which helps with bio-diversity and other products like oil, jam and truffles. The brothers are keen to have a light impact on nature and since 2010 the estate has been certified organic. We tasted a wide range of their wines, including a sparkling, but it was the reds of the Cònero Rosso DOC and Cònero Riserva DOCg that really got to me. All of these are made from 100% Montepulciano grapes. They produce a comprehensive range too starting with two very different Cònero Rosso DOC. The fresh, unoaked Aiòn was a great start, but the botti aged Moroder Cònero Rosso was a real step up in complexity. Botti in the cellar of Azienda Agricola Moroder. 100% Montepulciano long macerated on the skins to give good colour and flavour, then aged for 24 months in botti, large barrels of 2700 litres. The nose is lovely with one leafy notes, chocolate and ripe red fruit. The palate is beautifully structured with delicate oak, ripe fruit and tamed tannins. There is plenty of fruit with earthy and mineral flavours. I loved this wine and think many others would too if we could just buy it – 89/100 points. 100% Montepulciano aged for 24 months in botti, large barrels of 2700 litres. As you might expect this was much more developed than the 2013 version. The fruit had turned much more savoury, earthy and leathery with a meaty and tomato stem quality. It was a splendid wine, a bit of a treat really, but needed food. The younger, brighter wine was more for me – 89/100 points. This is their standard Cònero Riserva DOCG, the grapes are carefully selected, with low yields and the wine is aged for 30 months in oak, half in 10,000 litre botti and the other 50% in barrels. The nose is gorgeous, with lifted damsons, sweet cherry and smoky, coffee / mocha notes. The palate is full, smooth and rich with some intense dried fruit characters, fresh acidity and a lovely earthy, savoury character leading to a very long finish. I was hugely impressed by this wine, it was concentrated and intense, with lovely mineral, earthy notes and a wonderful backbone of fresh acidity – 90/100 points. This is their top wine, a Cònero Riserva DOCg called Dorico in celebration of the Greeks who brought grape growing to the Italian peninsula. This cuvée is made by a very careful selection of the best fruit that is left on the vine for 2 extra weeks to get even riper. 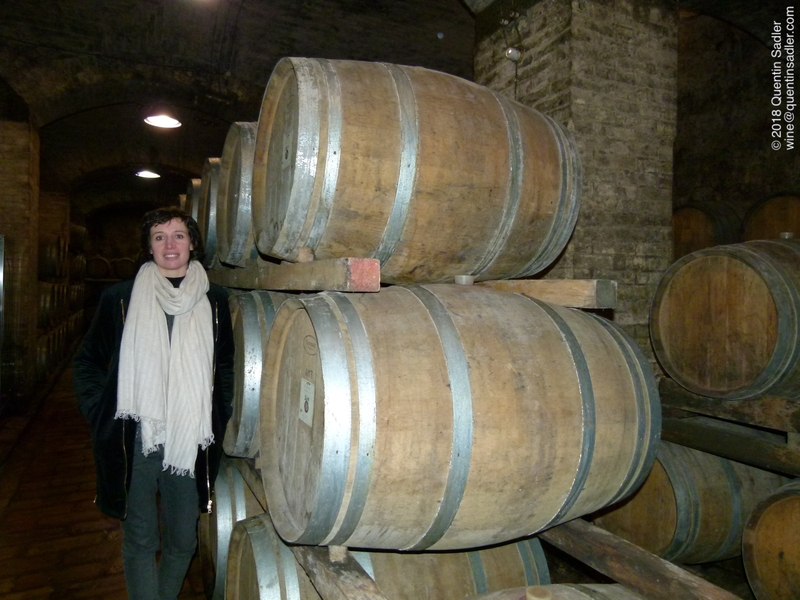 The wine is aged for 36 months in barriques, 225 litre barrels. The nose is gorgeous, with lifted damsons, sweet cherry and smoky, coffee / mocha notes. The palate is full, smooth and rich with some intense dried fruit characters, fresh acidity and a lovely earthy, savoury character leading to a very long finish. I was hugely impressed by this wine, it was concentrated and intense, with lovely mineral, earthy notes and a wonderful backbone of fresh acidity. It was one of my two favourite reds of the trip, beautifully balanced with tension between the richness of the fruit and the grapes natural acidity and the minerality of the style. Again the tannins of this famously tannic grape were very well tamed – 93/100 points. Some of the Moroder wines are available to be shipped to the UK – until Brexit ruins everything – by Uvinum. Umani Ronchi is one of the really famous names from this part of Italy, but despite the scale on which they operate, everything of theirs that I tasted was very good indeed. The company was created and is still owned by the Bernetti family. Michele Bernetti is the CEO while his father Massimo is the chairman. 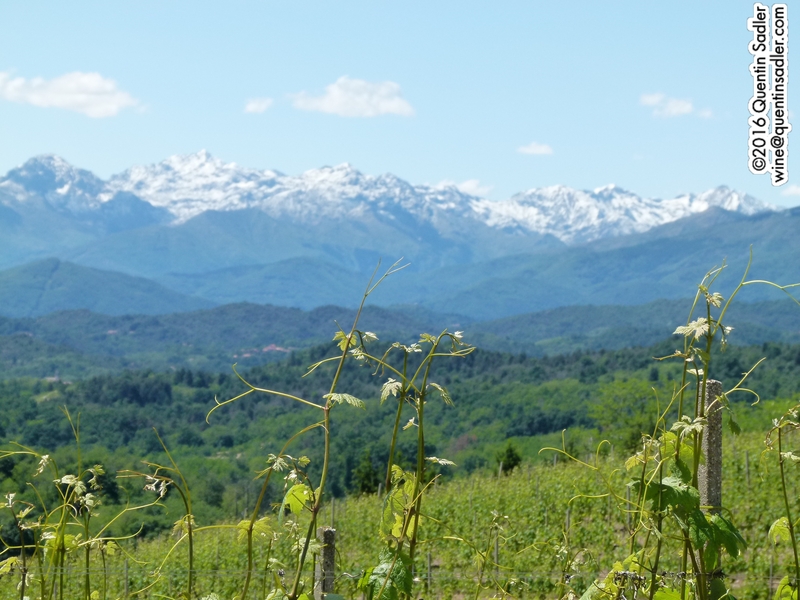 It’s a pretty large estate run on several different sites as they produce Verdicchio wines and wines in neighbouring Abruzzo as well as in Cònero and all their vineyards are farmed organically. Some of Umani Ronchi’s Cònero vineyards. 85% Montepulciano with 15% Sangiovese fermented in stainless steel aged in stainless steel to preserve the juicy fruit. Everything about this wine is fresh, juicy and lively. The colour is vibrant like liquified raspberry. The nose gives bright, fresh lively raspberry fruit together with a touch of herb and pepper. The palate is plump, chunky, smooth and supple with loads of bright, rich fruit and a light touch of chalky tannins on the finish. This is a happy wine that is very modern, very fruity and beautifully made – 89/100 points. The Umani Ronchi barrel cellar in Cònero. 100% Montepulciano grapes carefully selected from the San Giorgio vineyard which was planted around 2000 and is trained into bush vines in order to stress the plant and produce small yields. 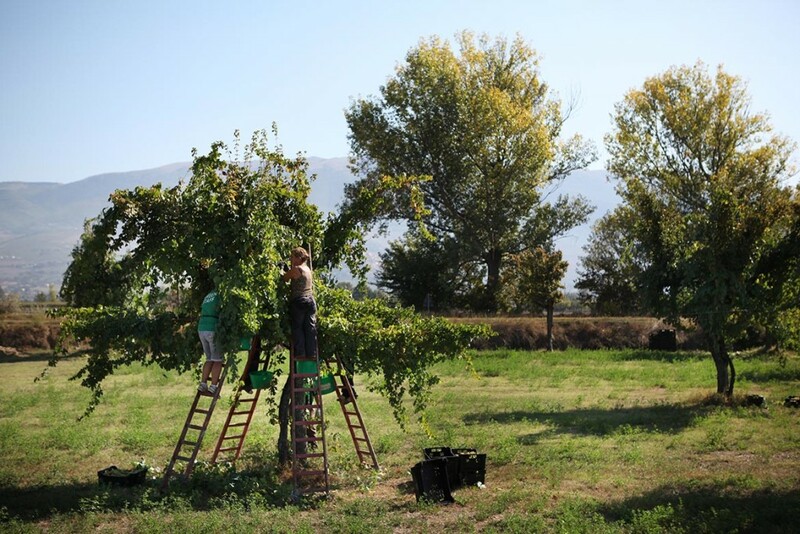 Everything is done by hand in this vineyard and everything is done to ensure a small crop of concentrated fruit. The grapes are fermented whole, but without the stalks, using the natural yeast to give a spontaneous fermentation. 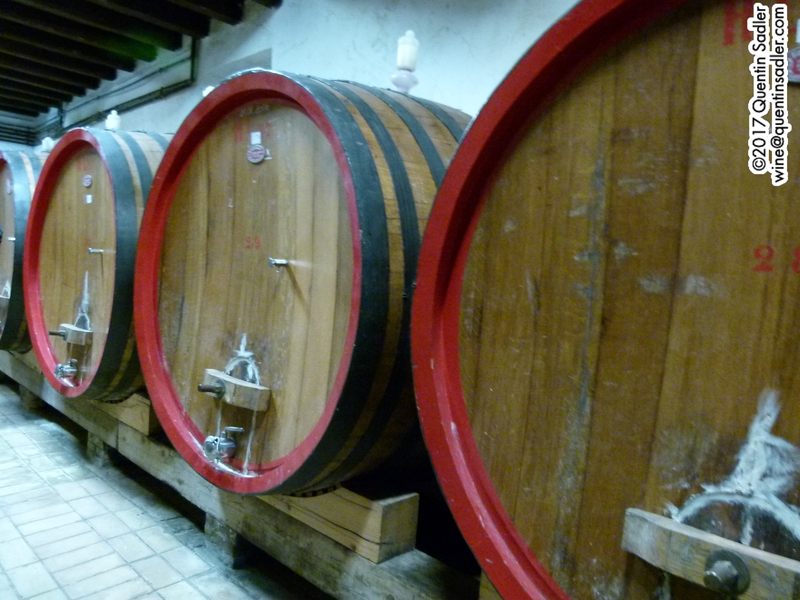 The wine is aged in new oak barriques for 12-14 months depending on the parcel the barrel. They only make around 4000 bottles of this wine. The ageing and the maturity really show here, it has an earthy, garnet colour. The nose delivers salty, tangy, earth, sweet cherry and raspberry notes. The palate is lovely and supple with a fresh, breezy feel, the oak makes it mocha infused and there is a wonderful concentration of fruit. All in all it has a lovely balance between lightness and richness. There are nice fine grain tannins on the finish, while the minerality and freshness give it great elegance. A very fine and very beautiful red wine – 94/100 points. I also tasted the 2010 Campo San Giorgio which was also very good, but I thought the 2011 just had the edge – although I would happily drink either. 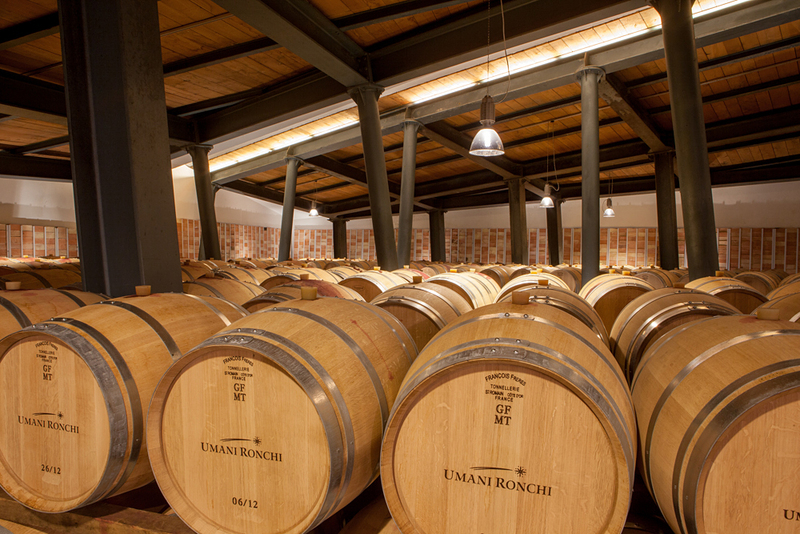 Some of the Umani Ronchi wines are available in the UK from Tannico.co.uk. It does seem very strange to me that these are so rarely available in the UK. They deserve to be more widely seen here as the general quality seemed to be very high indeed. The style struck me as being very accessible and would prove popular with anyone who enjoys Chianti, Rioja or Bordeaux. There was nothing odd, rustic or quirky about these wines, they deserve to be widely known and enjoyed and not just treated as an obscure oddity. As you can see I liked some of these very much, the best of these red wines were as good as anything I have tasted this year. 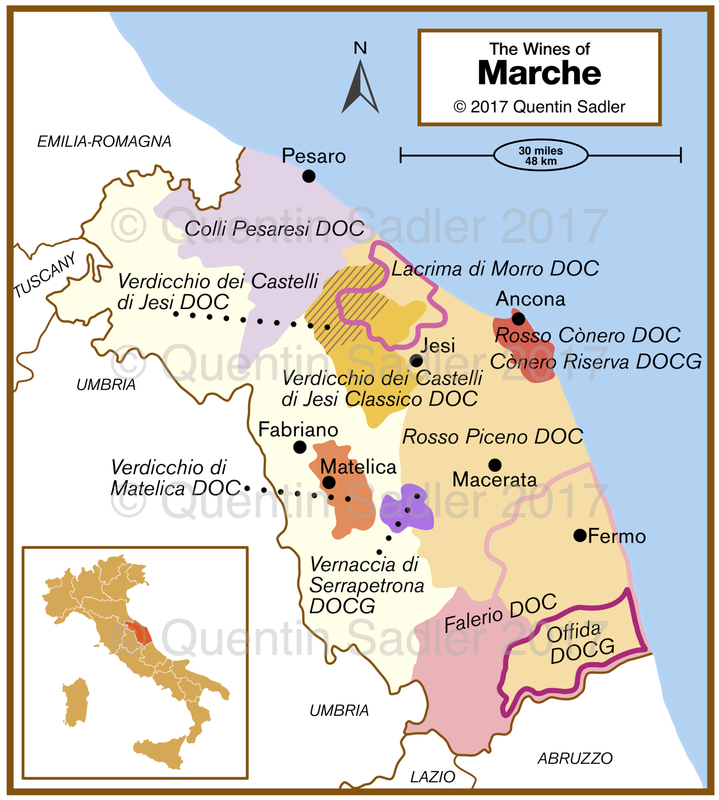 I will leave it at that for now, but I have more to say about the wines of the Marche, some more producers and styles to mention, so will return to the region soon.